[DG]: This episode starts with 246 days left, making it June 10, 2199. 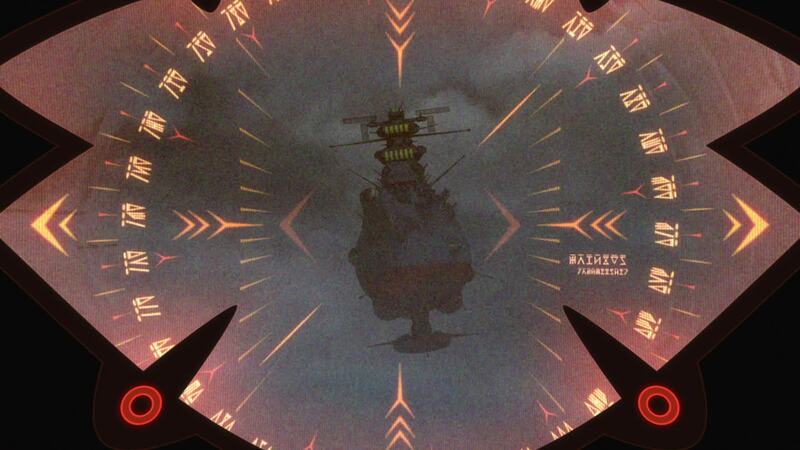 Seventeen days have passed since Yamato began its plan to use the warp gate to Balun. 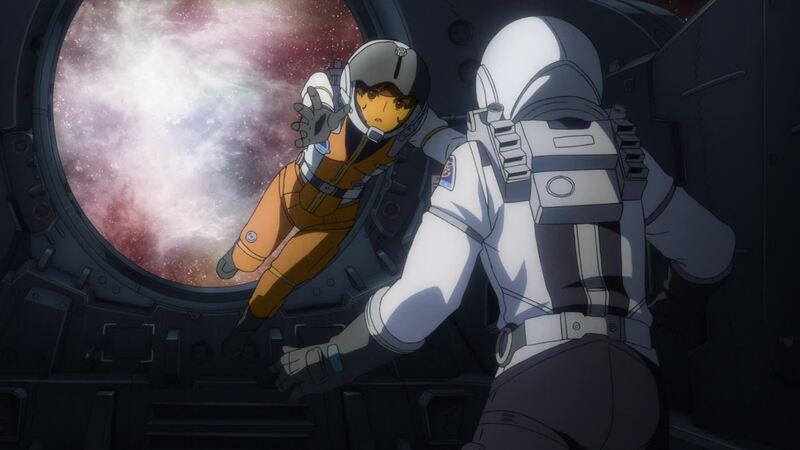 This is also the second episode in the series directed by Noboyushi Habara, who discussed both Episode 9 and this one in a September 2013 interview just as Chapter 7 of 2199 was ending its theatrical run. [LC]: This episode’s plot is based largely in the original Episode 21, with massive upgrades in terms of both plot consistency and design. Planet Great Garmillas. The unusually peaceful space surrounding the Garmillas home planet is broken by the eerie glow of a subspatial breach. Through it surfaces the UX-01. 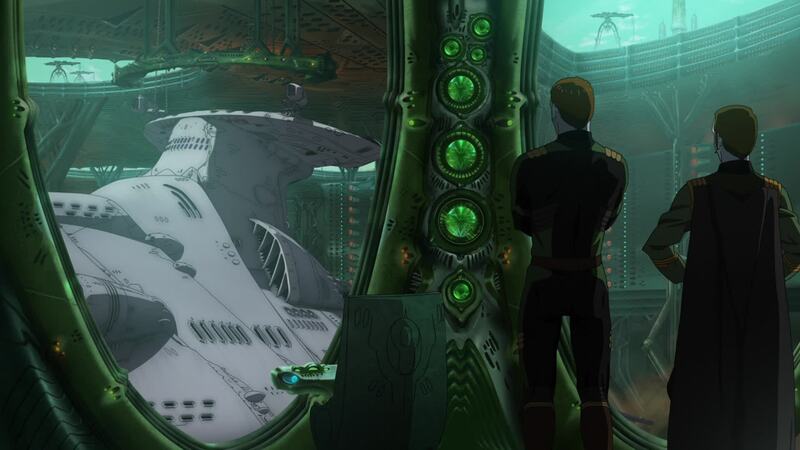 Dessler stands in the conning tower, gazing at the night side of the green orb before him, his face illuminated by the sunlight. 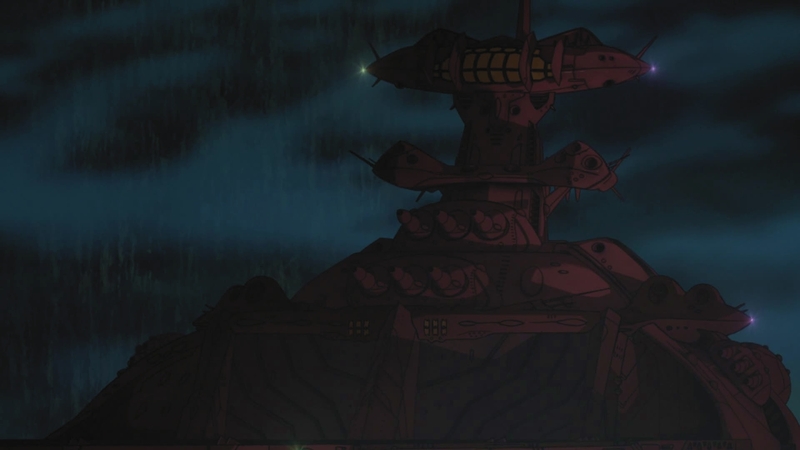 [DG]: Here we see that the conning tower has more than ample room for someone to stand, and instrumentation to keep abreast of things, should the captain want to take a manly stance on the surface during battle. 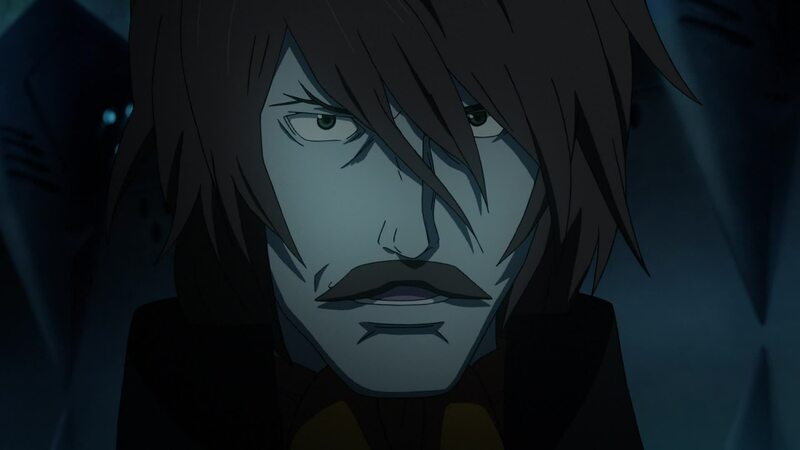 Or pretend he’s Harlock. Both of which Frakken gets to do in a later episode. And I think he nails it. UX-01 made it back to Garmillas in a little over two weeks after the events at Balun. How long the trip took, we don’t know. 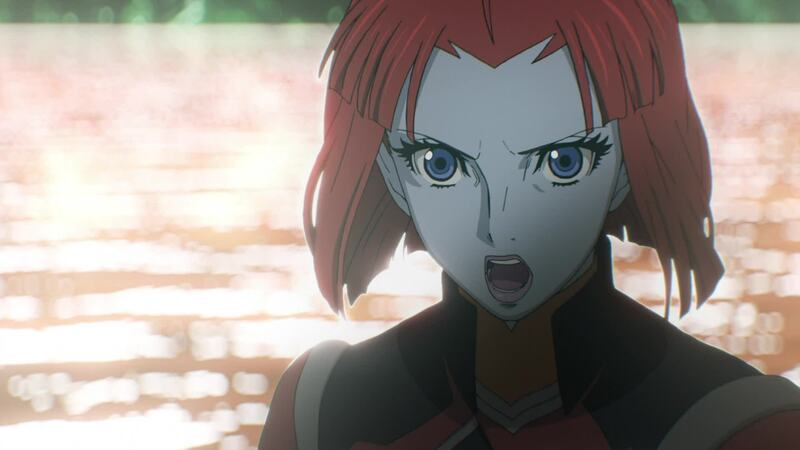 For all we know, Dessler could have done a number of other things before returning to Baleras, and we have no benchmark to compare subspace travel aboard UX-01 to using a conventional Geschtam drive. At best, we can assume that they achieve the same speed as a Geschtam jump, then he was transmitting his message to Balun from a much closer location to the Salezar system. 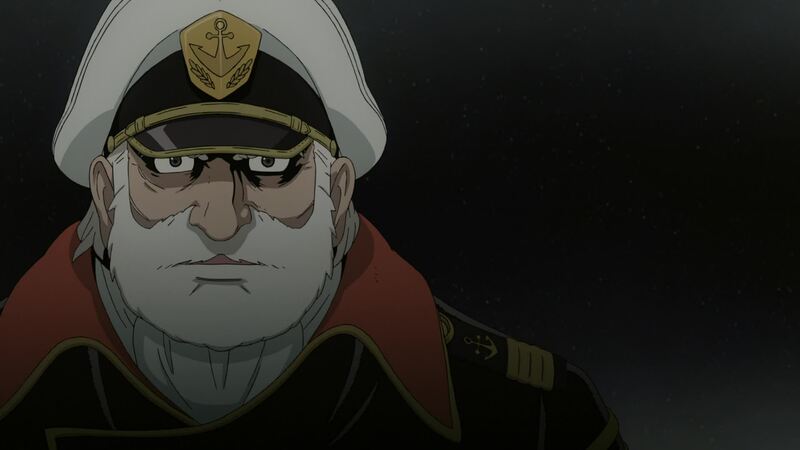 He wouldn’t have had to travel to Balun to make the transmission; Hyss transmitted real time communication from Baleras all the way to Domel inside the Milky Way back in Episode 15 when Domel’s task force was about to blast Yamato into atoms. All we can deduce from Dessler’s circumstances is that he was inside the Large Magellanic Cloud when he contacted Zoellick. 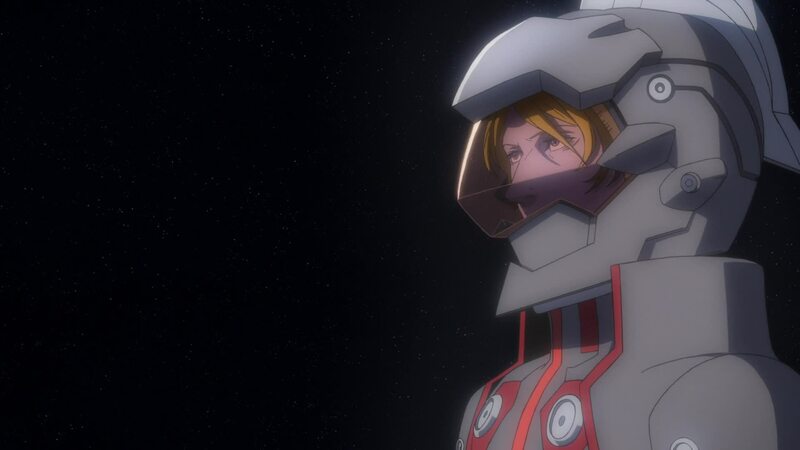 Dessler’s space suit design is an upgrade of the one he wore in the original Episode 26. Just sans cape, which one could say was an appropriate removal from a practicality or safety perspective. 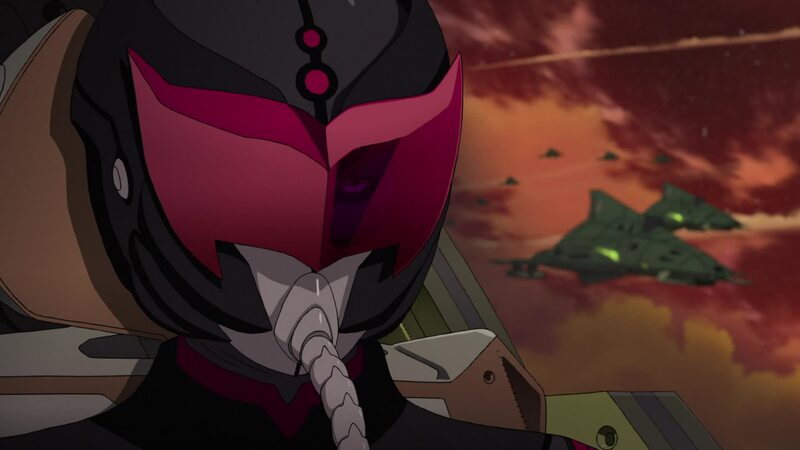 That said, how much more manly and Harlock-y would he look if the suit still had the cape? He’d look awesome but from 2199’s more realistic setting, there would probably have to be a “cape entourage,” operating some sort of rig to make his cape flutter in the vacuum of space. 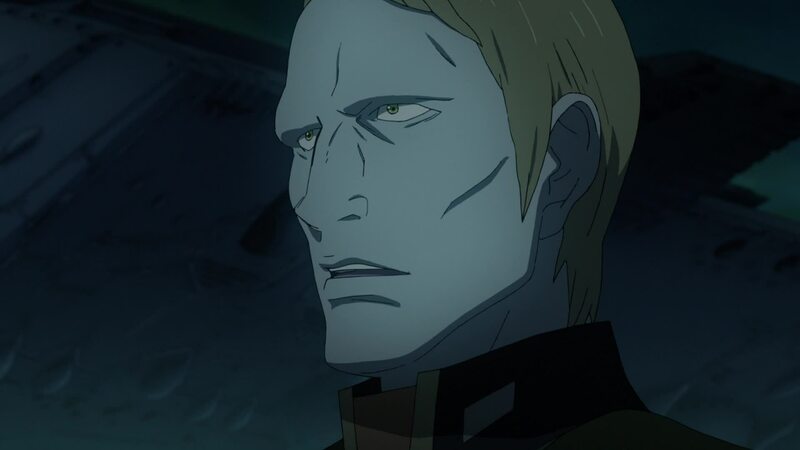 Dessler wonders what is the point of clinging to this planet. Frakken interrupts his musings, announcing they’ll soon enter the atmosphere and asking him to come back inside. 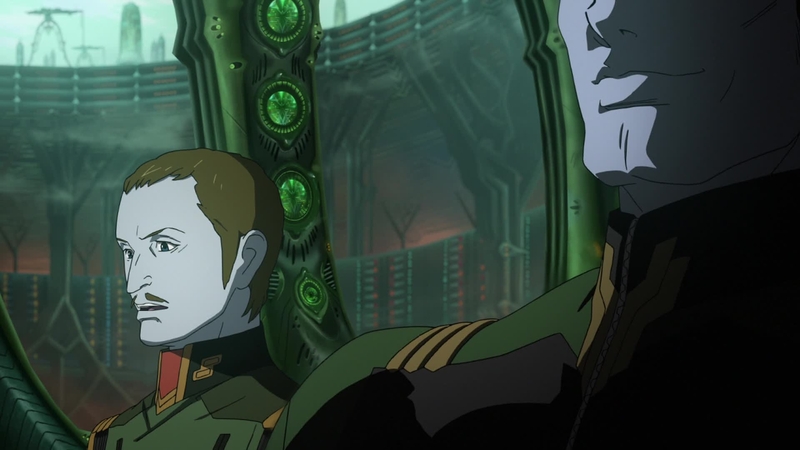 Dessler closes his eyes, immersed in thought, as the bright lights of Baleras come ever closer. Another man immersed in thought is snapped back to reality as the silence of his prison cell is broken. 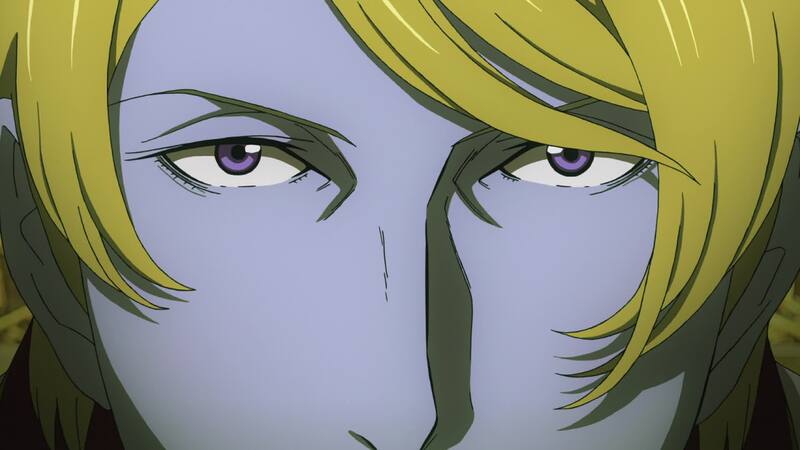 [LC]: Most of us remember the original Dessler as fiercely devoted to Gamilas. 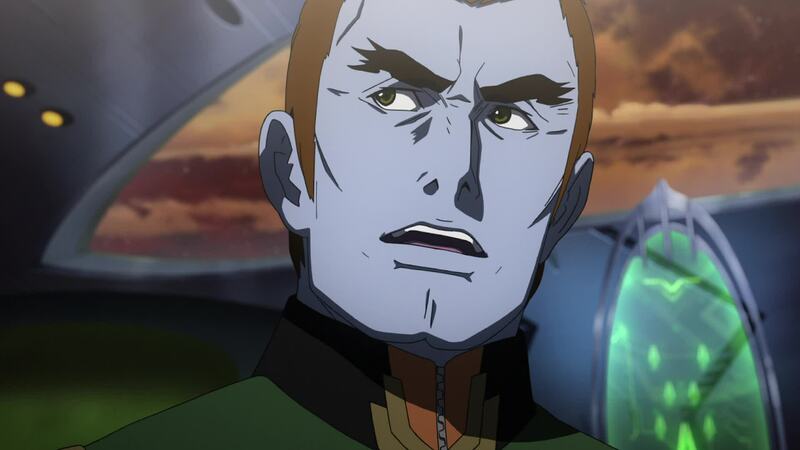 especially his classic line “As long as I live, Gamilas lives.” As such, this line seems to be a bit of a change for the character. 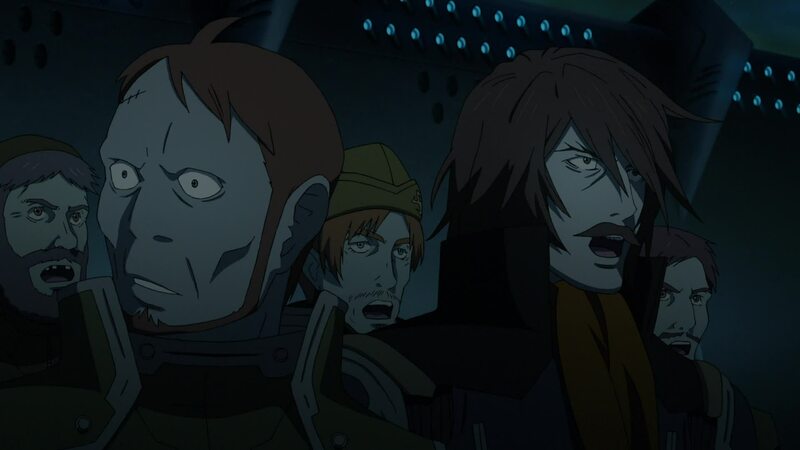 But if you recall, Dessler only became like that in Yamato 2 and following works. 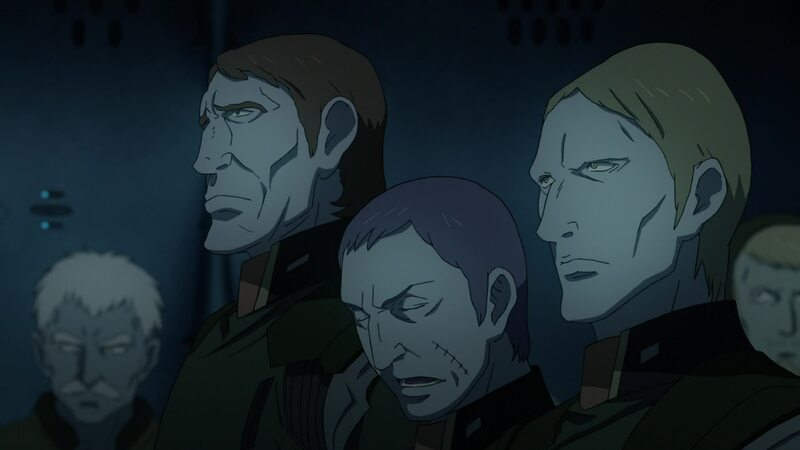 Dessler in the original first season was not such a patriot. He was mostly a smug douchebag who didn’t much care for Gamilas or his people. By the end of the season his obsession for the one force that defied him drove him insane and downright homicidal. Poor Hyss never saw it coming. So this disdain for Garmillas isn’t really new, just the way it is presented. 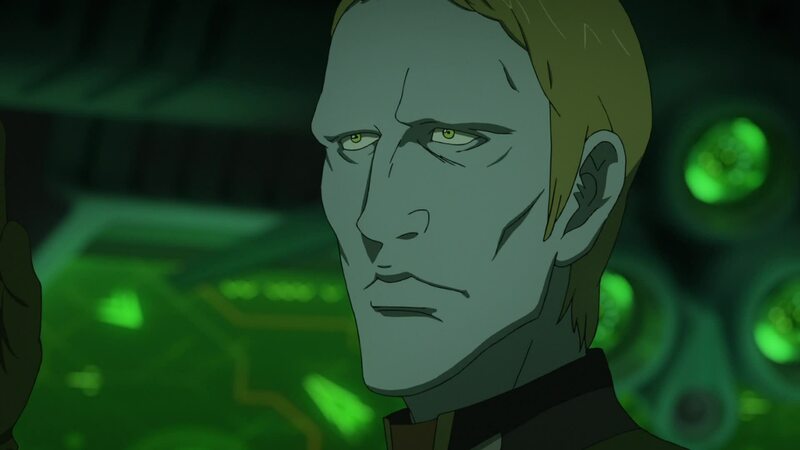 Dessler is smug but not as over-the-top as the original, though his contempt for his people has been seen in previous episodes. 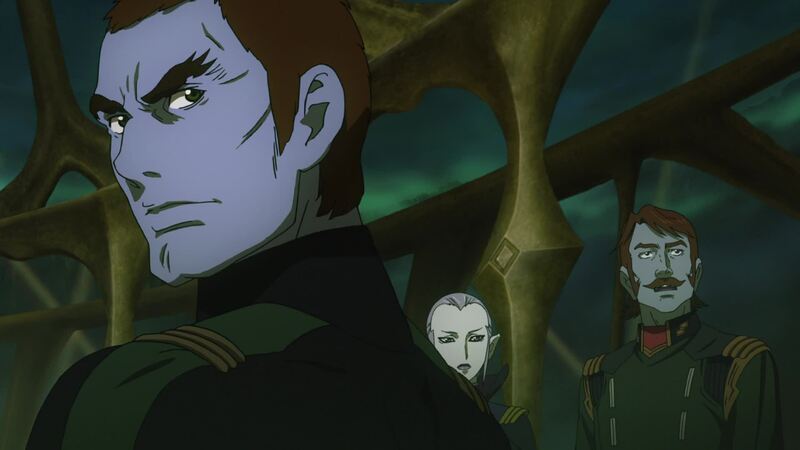 But the contempt for Great Garmillas itself… it feels strange because of the lingering image we retain of Dessler. But looking carefully at what we’ve seen in 2199, it shouldn’t be a surprise. We’ve already heard dialogue about his intention to move the capital, and later in the episode we’ll finally see the instrument for such undertaking. Other scattered pieces of dialogue throughout the series hint that Garmillas may not be well. The planet itself seems to be suffering some sort of change for the worse. We hear characters talk how the air in Garmillas is worse each day, and I don’t think that simply applies to the increasing climate of fear imposed by the Imperial Guard. I think they are being literal. In the original, Garmillas oceans were sulfuric acid and though they were never so described in 2199, their yellow tinge may be an indication of exactly that. And given Garmillas are 99% human… would their world have oceans of acid? Or did the increasing industrialization of the planet for the purpose of war cause the environment to decay to such an extent? This, added to his obsession with Starsha, would thus be the driving force behind his move to New Baleras and regarding Great Garmillas as something that he must eventually cast aside. 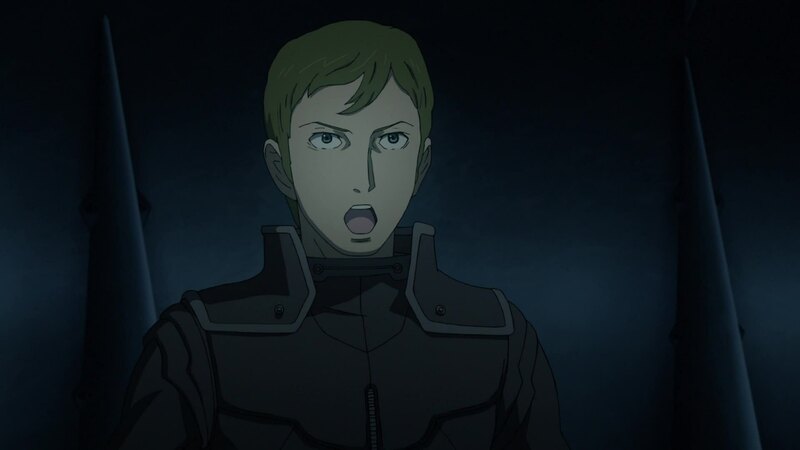 [LC]: It’s a nice touch that Dessler acknowledges that his theatrics, though exposing the actual traitor in their midst, have resulted in a less than desirable situation. Especially with Yamato now entering the Large Magellanic Cloud. [DG]: And again, we’re back to the “Zoellick” spelling in the subtitles, which last episode was “Zoellik.” Consistency has not been the translators’ strong point. Domel says he’s been told it will take a minimum of three months for the main fleet to return to Great Garmillas. Ghader Talan explains that since Balun was the connection hub of the Geschtam Gates hyperspace navigation network, the fleet was stranded without connection to the Magellanic side. It also means it is now impossible for their primary fleets to reach Yamato via normal Geschtam navigation. [LC]: The diagram confirms that only the Magellanic Gate was destroyed at Balun. You’ll notice only the icons on the Magellanic Cloud shut down, while the ones on the Milky Way Galaxy remain active. 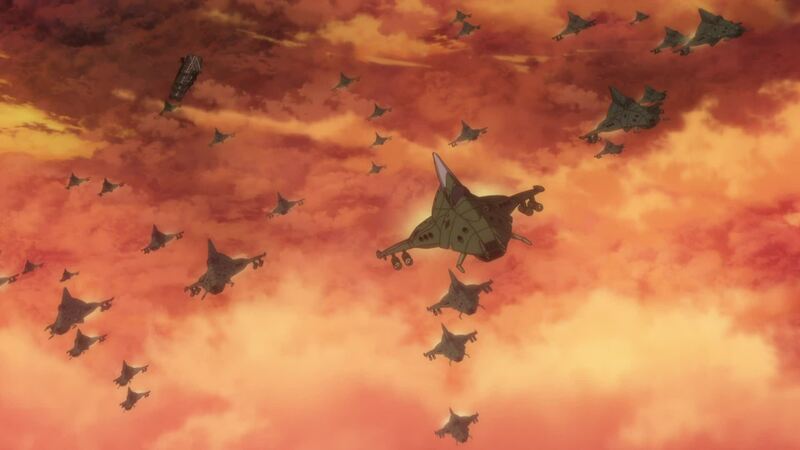 The whole setup of the previous episodes brings us to this point, providing a neat explanation for a question that many fans asked about the original: why would Domel strike at them with just a small group of carriers? 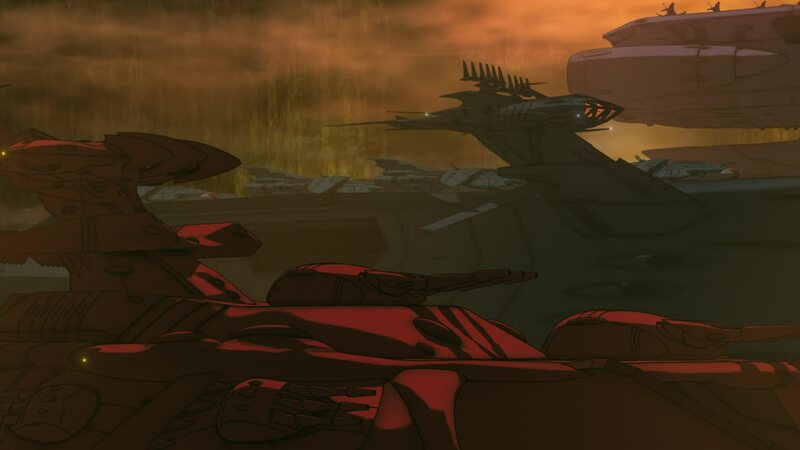 Why was it that even though they were deep in Gamilas territory, there was no massive fleet standing in their way? 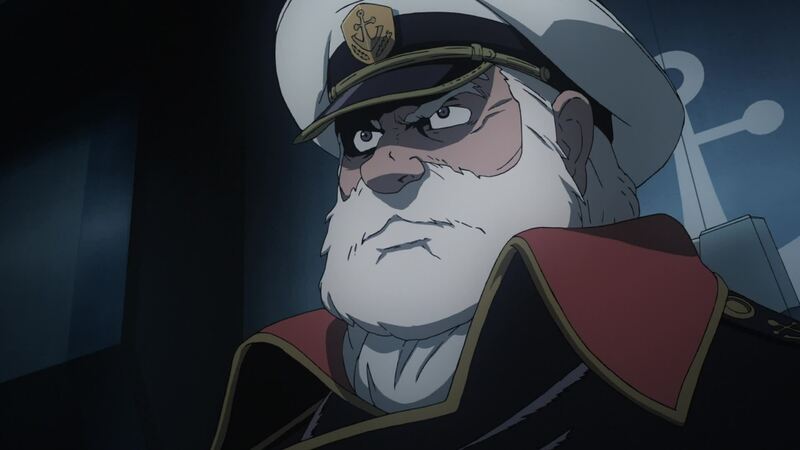 By having the bulk of the Astro Fleet stranded three months’ travel time away, and only the Imperial Guard Fleet stationed at Garmillas, Domel has to make do with what he’s provided, having to come up with a more colorful strategy instead of crushing the enemy with sheer numbers. 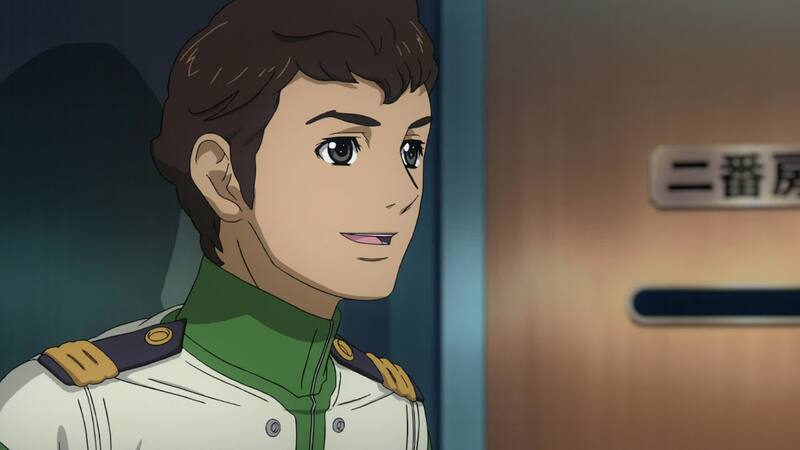 Domel asks Dessler to issue the order for him to sink Yamato. When Dessler asks if he will do it, Domel says he will, at the cost of his own life. Hyss tells him they’ve prepared the best crew available for him, and that should he defeat Yamato, his wife’s punishment will be reduced. Domel says he’s grateful. 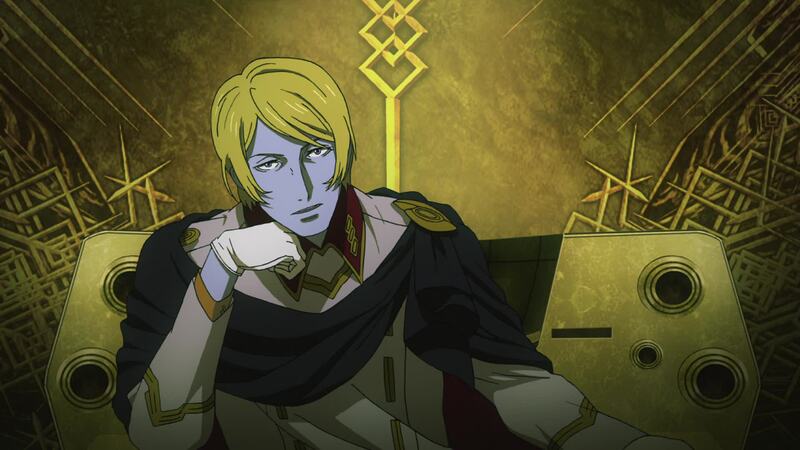 With a serious expression, Dessler tells Domel he has one more request… just for him. [LC]: Even though we haven’t been shown that bit of the story, it seems to have been proven that both Elisa Domel and Gul Dietz were involved in anti-government activities. The question of whether that proof might have been fabricated could still be brought to bear. But given the events of upcoming episodes, I tend to believe their involvement was actually true. Though not aligned with Zoellick, his power play ended up revealing other groups that oppose Dessler’s rule, and theirs was one of those unfortunate enough to be a useful scapegoat for the Army General. [DG]: Confirmation is verbally provided that the entire “conspiracy” has been to root out dissent in the ranks, and expose Zoellick’s treachery. However, this doesn’t explain Dietz’s arrest, nor Elisa’s. Thus, you have to assume that they were killing two birds with one stone, with Dietz actually involved in some sort of opposition to Dessler’s rule. Or, maybe it’s just Gimleh’s side project. 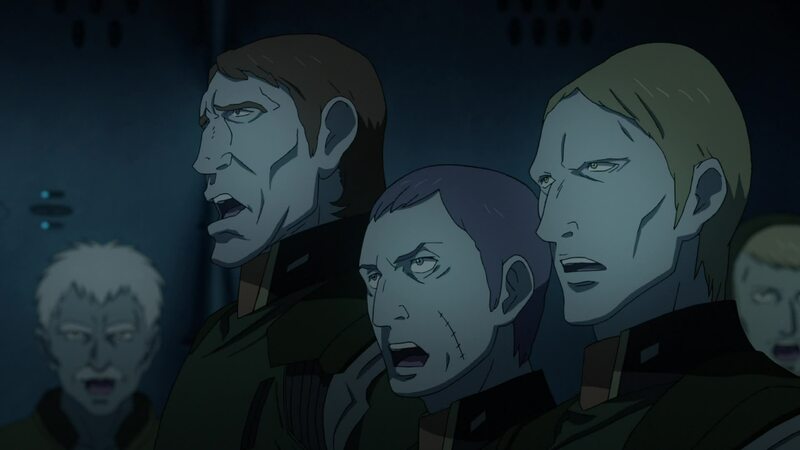 Or another sign of Dessler’s diminishing sanity. After all, just because you’re paranoid doesn’t mean they’re not out to get you. One other observation: Hyss just seems too smug here. 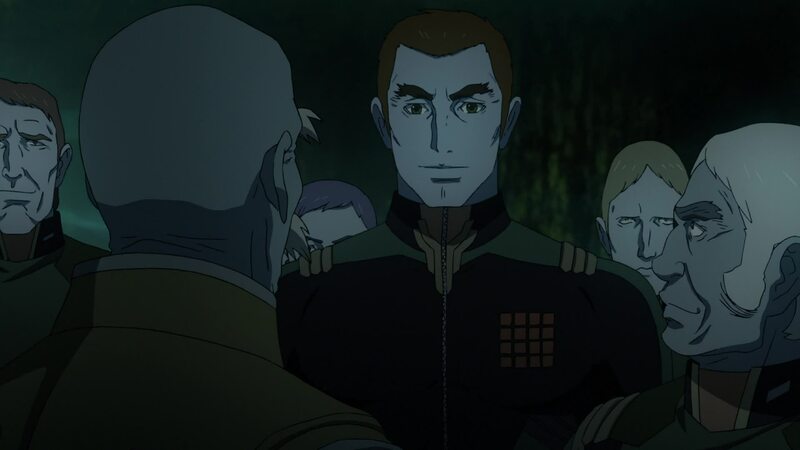 It’s as if he has something against Domel, which is surprising considering Domel, along with Dietz, is the most respectful in the Garmillas military. Yamato is bathed in the light of the massive Tarantula Nebula. 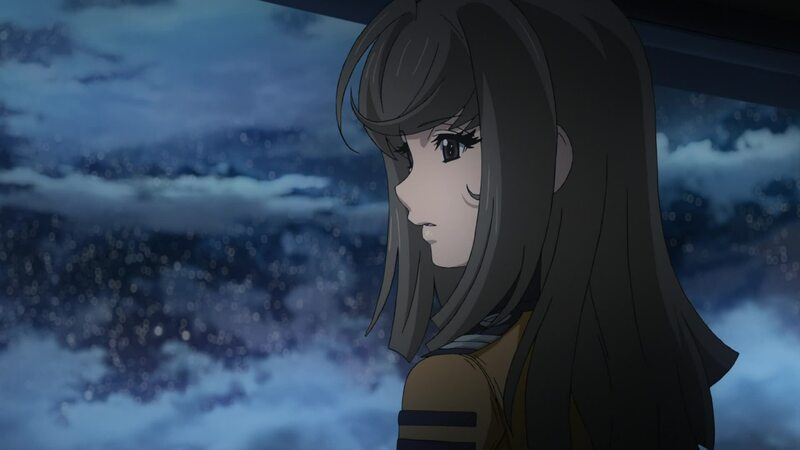 Shinohara sits in the small port catapult control booth, looking out the window at the starboard catapult. 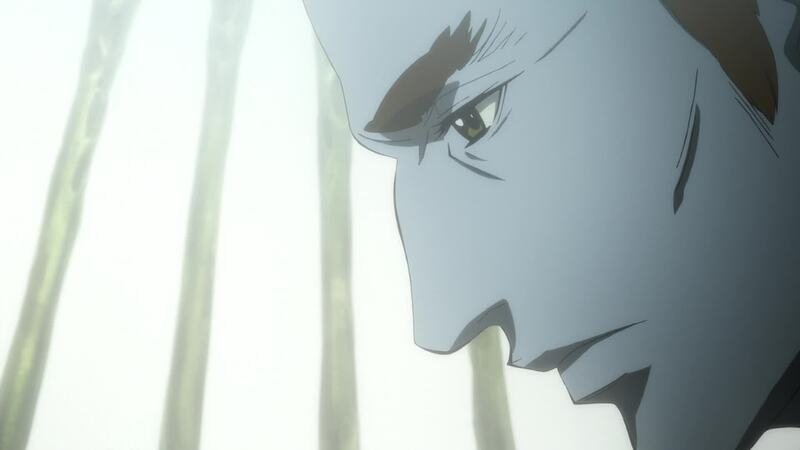 Yamamoto arrives, telling him Makoto is looking for him since he left the medical section without telling anyone. [DG]: Another wonderful backdrop of the Tarantula Nebula. Xebec’s background artists really did a fantastic job of rendering it throughout these two episodes. It looks alarmingly authentic compared to the most common images of the nebula that are available. 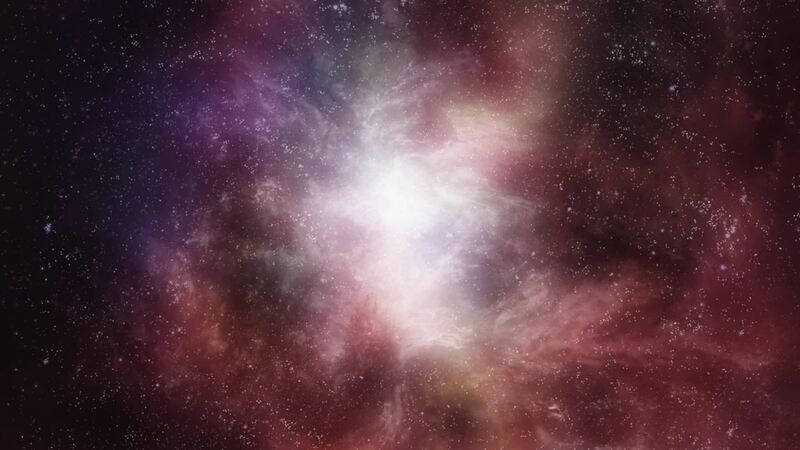 [LC]: For an unobstructed view of the Tarantula Nebula art, click the image above left. 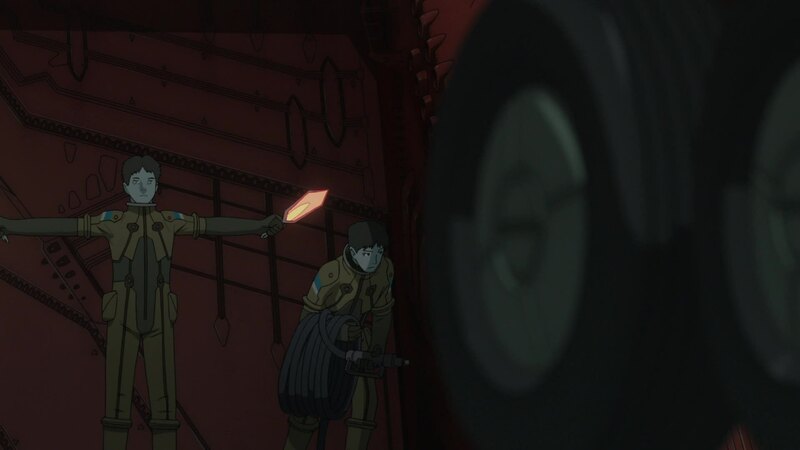 A less attentive viewer might believe there’s an error here, since we see Shino in the port booth but the catapult shown is the one on the opposite side. To be honest, it took me a while and a long look at the layouts in the Hyper Mechanical Detail Artworks book to get it straight in my head. The trick is that in most outer shots of this section, we usually see the two windows that face outward (above left). But there is another window facing the deck, which is only visible when the booth is in the raised position – note the starboard booth is lowered. The image below confirms this. Yamamoto is facing the rear of the ship with Shinohara looking to the starboard side and catapult. 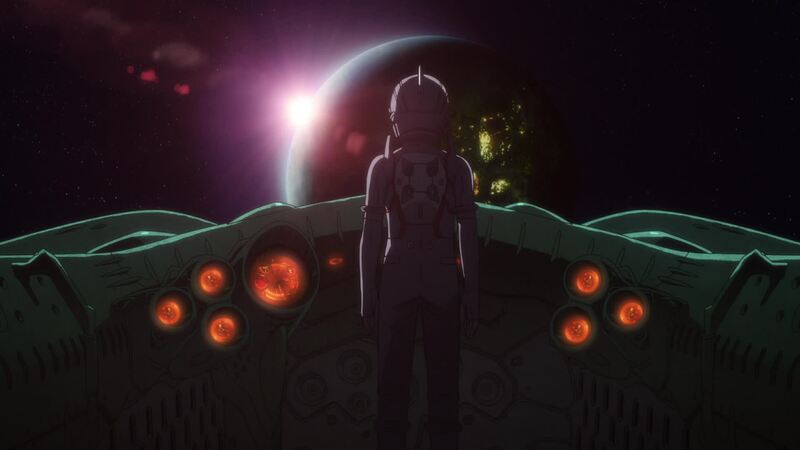 [DG]: Initially, I had the same problem with this scene, but then it made sense when I placed in context of Shinohara saying to Yamamoto, “This is where you launch from, eh?” Alpha 2 launches from the starboard catapult, so Shinohara would have to be looking out at the starboard catapult if he was being specific in relation to Yamamoto. Keeping his eyes on the catapult, he just comments that that is where she takes off from… Akira is caught off guard by this. Shinohara asks if she was sent to retrieve him and she says “something like that.” They hang out in the booth for a bit. 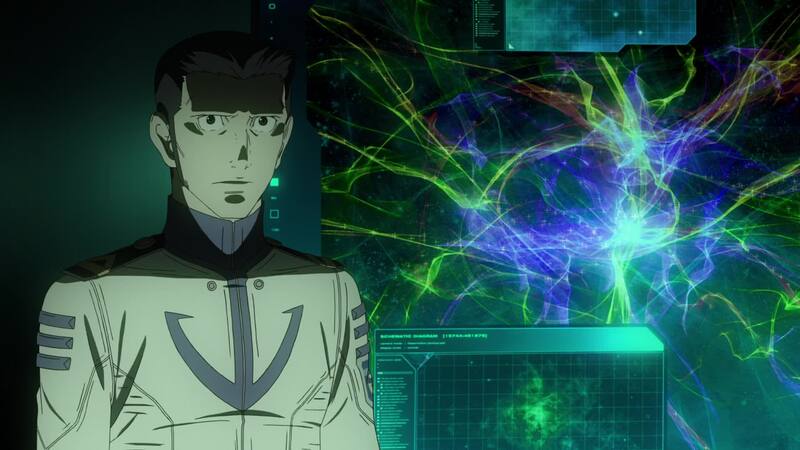 Yamamoto asks Shino if he was part of her brother’s squadron. He confirms, saying Akio was a good man. [LC]: Until this episode, there was no interior design for these booths. So episode director Noboyushi Habara, designed it himself as he made the storyboard. The production staff then refined the design to its final look. He’s surprised when she tells him she knows “Sword 3” was her brother’s call sign. 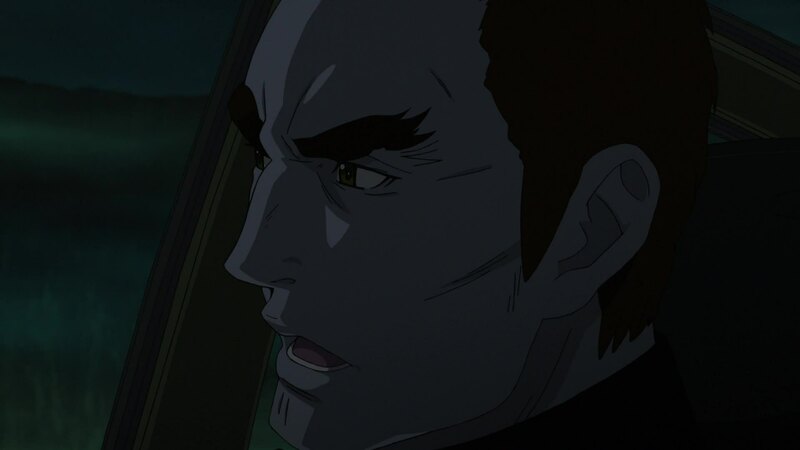 Shinohara feigns ignorance, saying Akio never discussed that sort of thing. Both Yamamoto and Shinohara agree that was the kind of man Akio was. She comments they’ve made it to the Great Magellanic Cloud and Shino confirms it. [DG]: When Shinohara and Yamamoto start discussing Sword Three, things cease making sense. 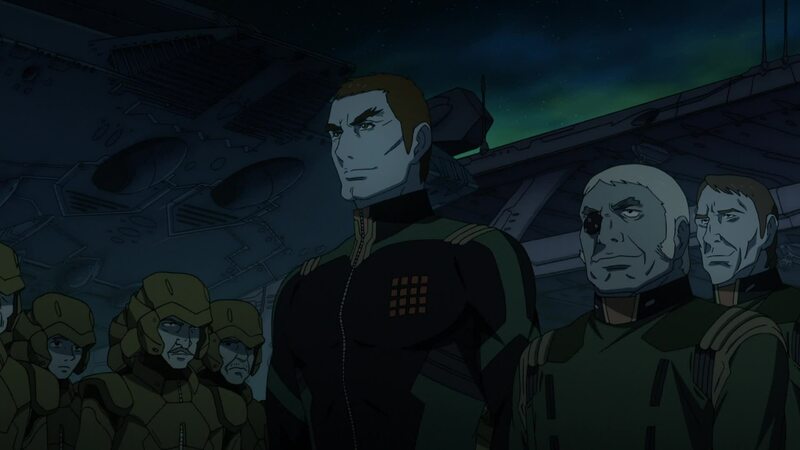 If Shinohara was in Akio’s squadron, how on Earth would he not know his team mate’s callsign? The only thing I can think is that Shinohara is nervous around Yamamoto. 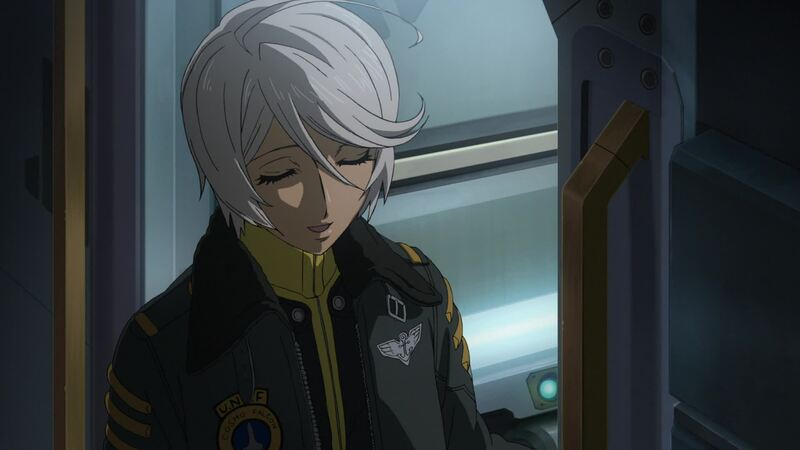 It’s been reasonably clear up to now that he’s romantically interested in Akira, emphasized by using her brother’s callsign on the reconnaissance flight at Balun. I have to attribute this statement to bungling nervous lovesick idiot syndrome, as it’s the only way it makes any sense. Poor boy is trying too hard. [LC]: Another explanation is that once again the subtitle translation fails to convey some linguistic nuance. Put simply, translator messed up again. Too frequent an ocurrence at this point. In the brig, Niimi congratulates the visiting Shima, saying he was right and that she never expected them to get this far. He responds that “right” is not how he’d put it, but the reality is they’ve made it. 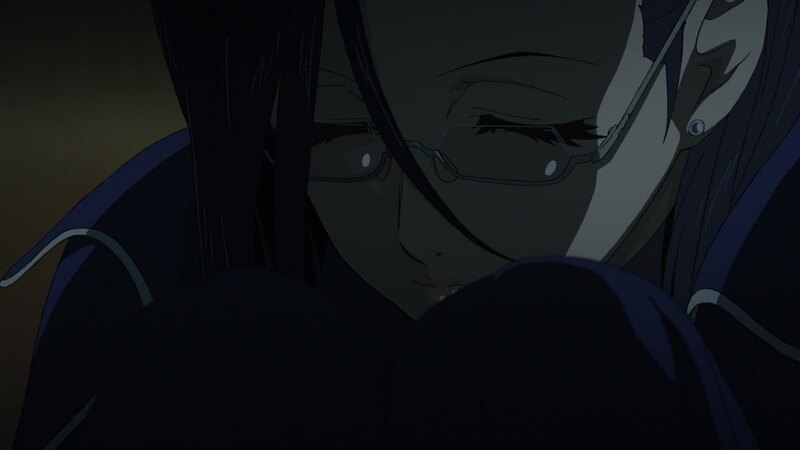 Inside the cell, Niimi closes her eyes and sighs in a mix of happiness and regret. [DG]: There’s an interesting layout to the brig here. At least four cells cascading (we see the kanji for four, then three, then two). Kaoru is in cell #2. Shima is trying his best to keep Kaoru’s spirits up. He recognizes that he owes his safety to her decision to stand up against Ito during the attempted mutiny. [LC]: There’s no official number for how many of these cells exist. But whatever production materials were released show only these four, even in broader plans including the security monitoring room and adjoining corridors. Ships don’t usually have a large number of cells, so four is probably not too much of a stretch. Only issue with that number is what happened a few episodes ago. We had a mutiny on board where a still substantial number of crewmen participated. We saw about 15 mutineers onscreen, most of them from the security team, taking over the bridge, captain’s cabin, pilot’s ready room and engine room. Even if we could confirm only those people were involved, that means they would have to put four people in each cell, which is obviously not the case. 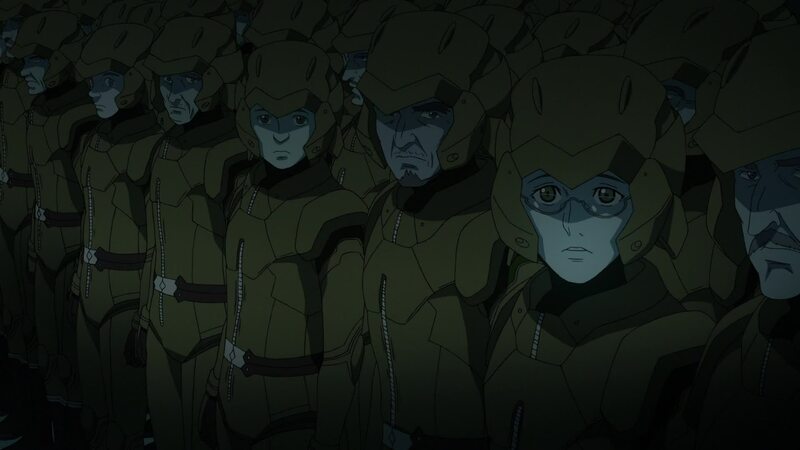 Not only would they be terribly cramped in such tight quarters, we’ve also seen Niimi is alone in this one, and later that seems to also be the case with Ito. a) there are more cells that were simply not in the production materials. A rather straightforward explanation, since they probably wouldn’t waste time designing anything that isn’t at least planned to appear and would probably just look the same as these. b) Quarters may have been modified to house the majority of the mutineers, with only the main instigators placed on the brig. We’ll see this being done in Episode 25, when Yuki locks Celestella in her own room, sealed by a numerical code. c) Though mutiny is considered a serious offense by military law, punishable by death in many countries, US military law states that court martial may apply any other punishment it sees fit attending the circumstances. Also, I doubt the death penalty is still in place in 2199. So most of the mutineers may have been given a more lenient sentence by Okita, depending on the degree of their participation. [DG]: That’s the key thing. Maybe some or all of Ito’s subordinates were found to only be acting on the information Ito gave him and weren’t found to know of Ito’s plot. Confined to quarters may be an option as well. That said, do we ever see those guys again in the series? I can’t remember off the top of my head. 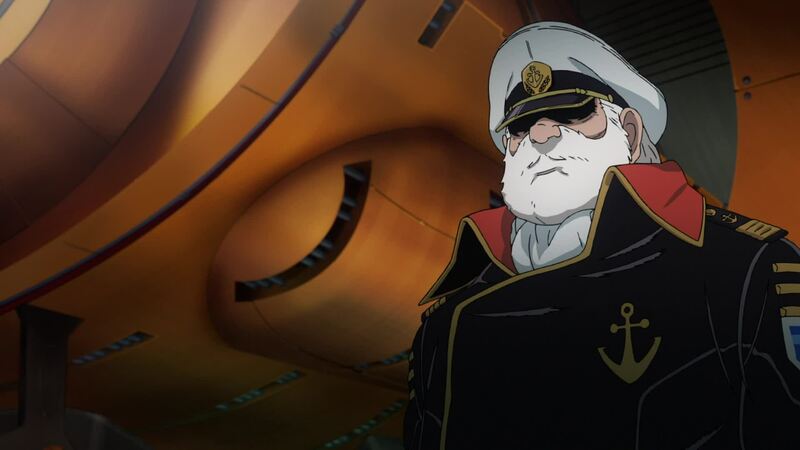 Overall, I don’t think they would have designed Yamato with more than four cells for the brig – they wouldn’t have been planning to have to deal with a major attempted mutiny. 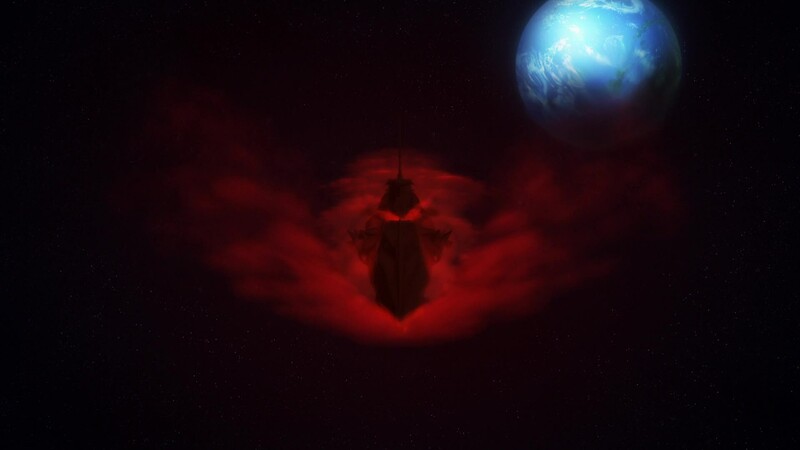 Yuri(sh)a sits on Yamato’s bow, looking at the vast nebula ahead of them. Hoshina joins her, asking what she’s looking at. She responds she is looking at the stars. Hoshina comments on how impressive the Tarantula Nebula is. She says that beyond it is Iscandar, and how she wanted to come home with her sister, Sasha. Hoshina whispers her name, saddened. Suddenly, she jumps off her perch and right at Hoshina, startling him. He holds her in his arms and tells her how dangerous that was. She apologizes and tells him Yuria wants him to hug her. Hoshina’s bafflement is broken when Yuri(sh)a obliviously asks him what a hug is. [LC]: The level of detail in these shots of the ship’s bow is amazing. And this is just one more taste of what’s coming next in this episode. [DG]: Okay. Is Yurisha playing dumb, or is this just a legacy of her isolated upbringing? Maybe even her age? Or maybe she wasn’t hugged as a child. This line is a clear indication that even though Yurisha has taken over her body, Yuria is still alive and well inside. Not only that but she seems to be able to actually “talk” to Yurisha. A military car moves along one of Baleras’ speedways. 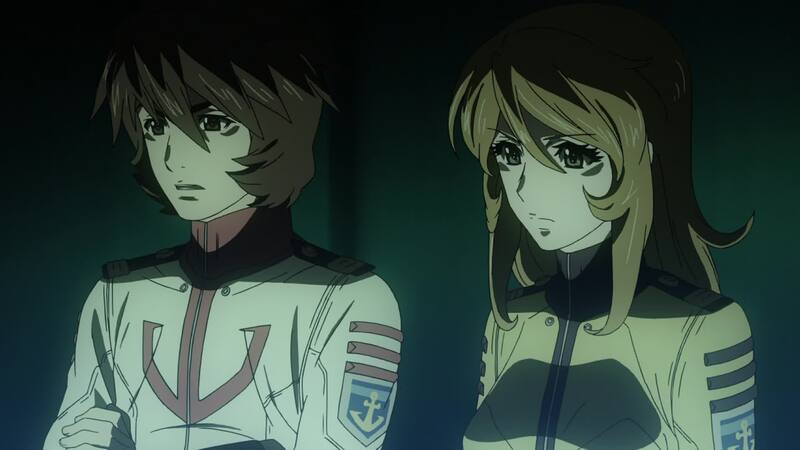 Inside, Domel reveals to a baffled Haidern that there’s an Iscandarian aboard Yamato. Domel asks him if he remembers Celestella’s impromptu visit to Balun. Haidern recalls she went there to investigate the Akerian ruins. 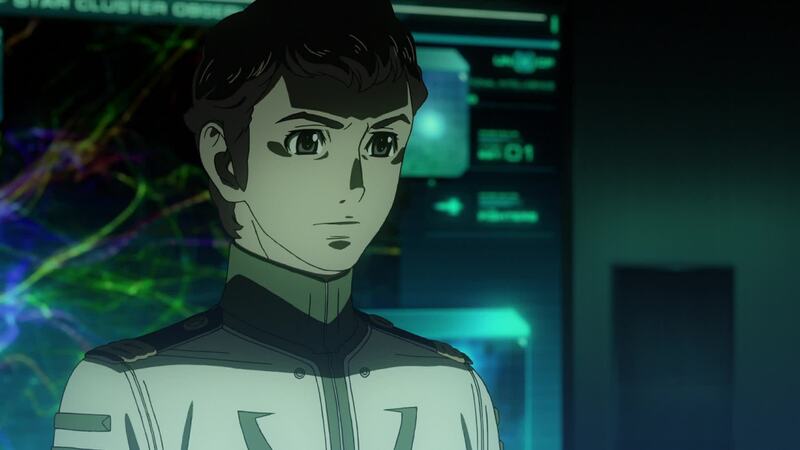 Domel tells him that Celestella used the ruins’ technology to gather intelligence on Yamato. Haidern says he didn’t know that was even possible. Domel continues, saying Celestella is a witch. And that thanks to that information, he’s now been tasked with a new mission. 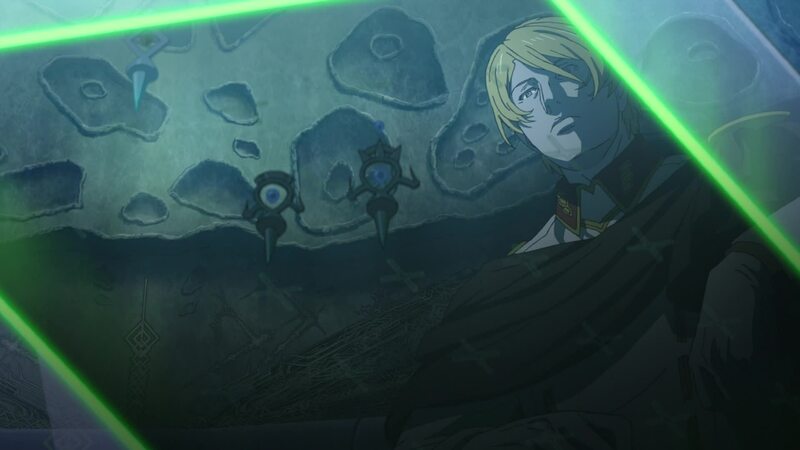 [LC]: Here we learn what Dessler’s special request was. He ordered Domel to retrieve Yurisha. This adds an extra layer of complexity to his task and to the plot itself. There is one small issue, though, which we discussed in passing back in Episode 15. 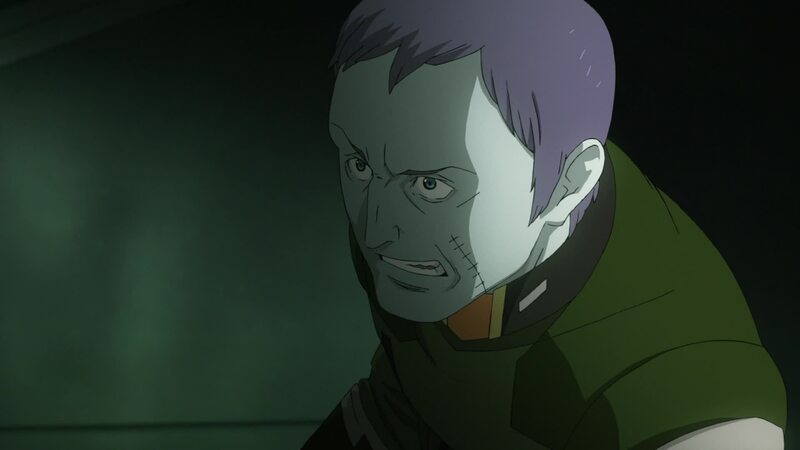 Dessler learned of Yurisha’s presence aboard Yamato at the start of that episode. Sure, since then he’s been busy being “assassinated,” coming back from the dead, and getting rid of those opposing him along the way. 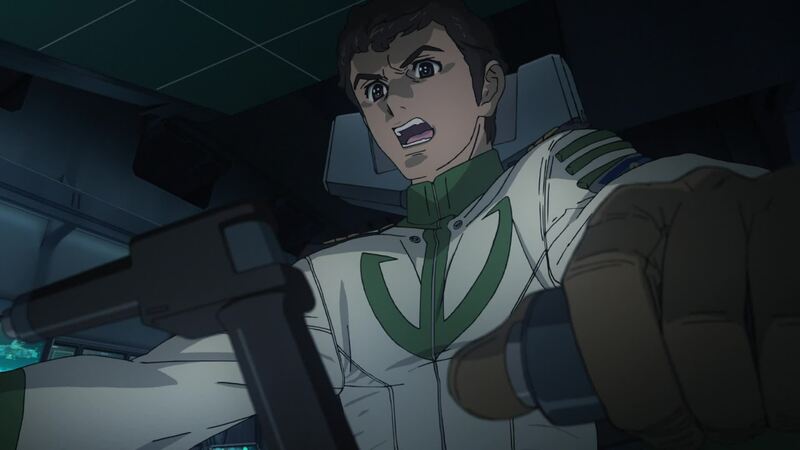 But in that same episode, Domel moved against Yamato and would have destroyed it if not interrupted by Hyss. Getting Yurisha back makes sense plot-wise, but it should have been brought to Domel’s attention back then. 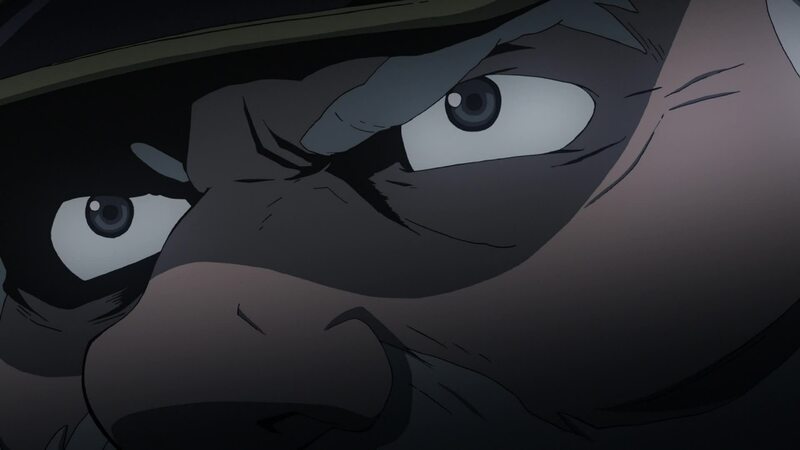 As I stated in Episode 15’s commentary, the manga version sidesteps this by having the attack occur before Dessler’s assassination and having the Leader himself stop Domel, in good old original series fashion. Domel looks out the window, spotting a small group of ships descending in the distance toward the very base to which he is now heading. 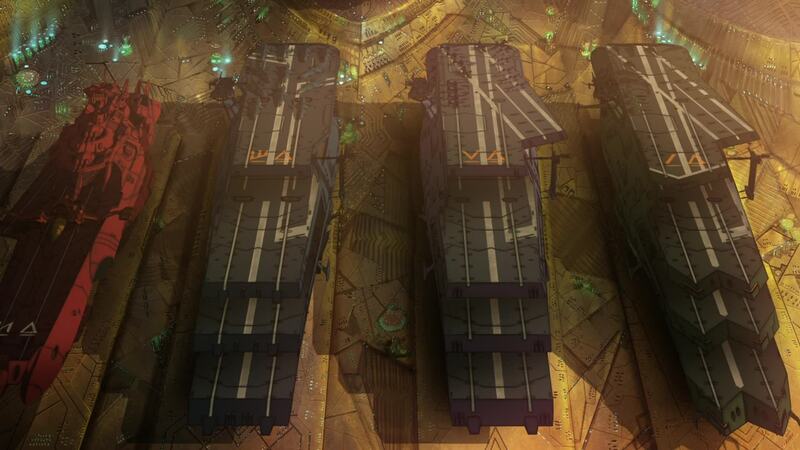 The fleet is composed of three Guipellon-class Astro Carriers, each with a different runway configuration. The lumbering giants Balgray, Lambea and Schderg make their approach to the berths in the massive naval base below. 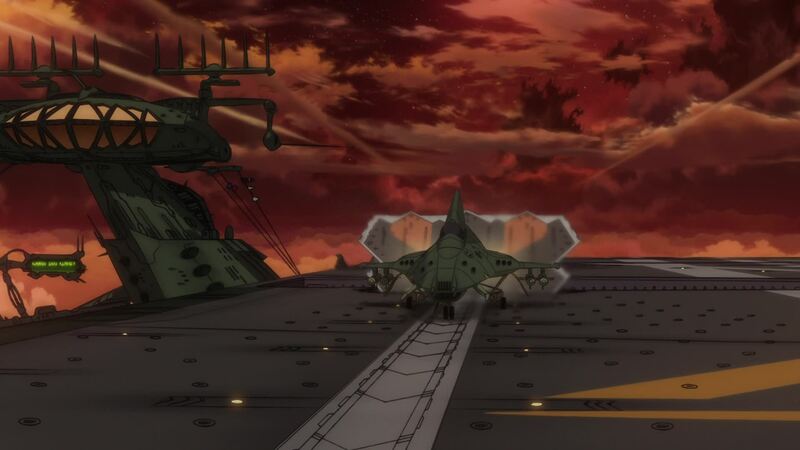 [LC]: This scene with the Guipellons coming in for landing is where Haidern, Berger, Ghetto and Kraitz first appeared in the original series, each commanding their own carrier. 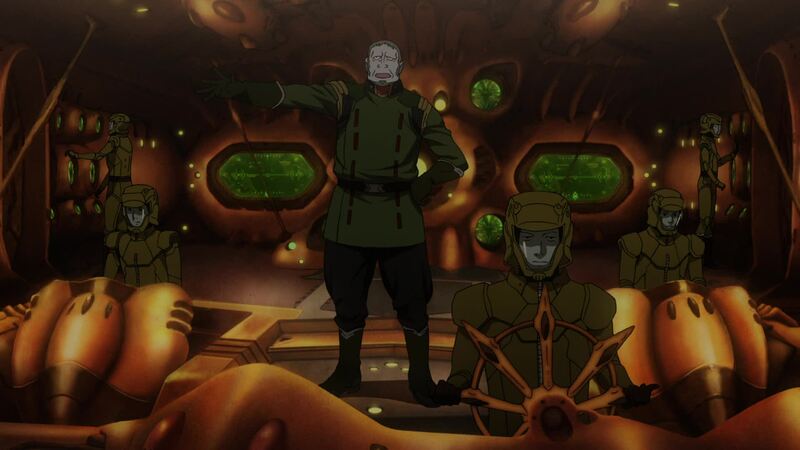 Given their new expanded roles in 2199, command of the Guipellons and Darold have been transferred to other characters. But as a nod to their origins, each of them is assigned to command the airwings in the carrier they captained back then. Berger and the Snukas (precision bombers) carried by the purple Lambea; Ghetto and the Debbakes carried by the green Balgray; and Kraitz and the Doljiras (Heavy Torpedo Bombers) carried by the blue Schderg. 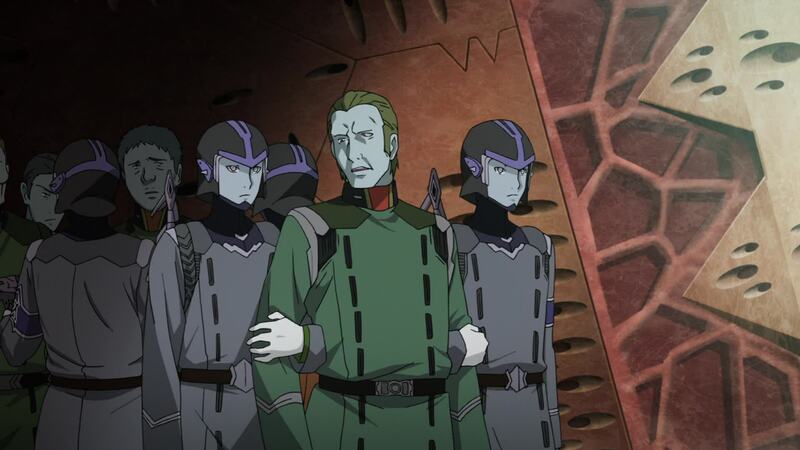 The odd man out is Haidern, who is now the captain of the Domelaze III and not assigned to the red battle-carrier Darold. The other oddity in this matter is Schderg which, maybe due to its more limited use, got no character to captain it in term of production materials. Meet the new captains here. 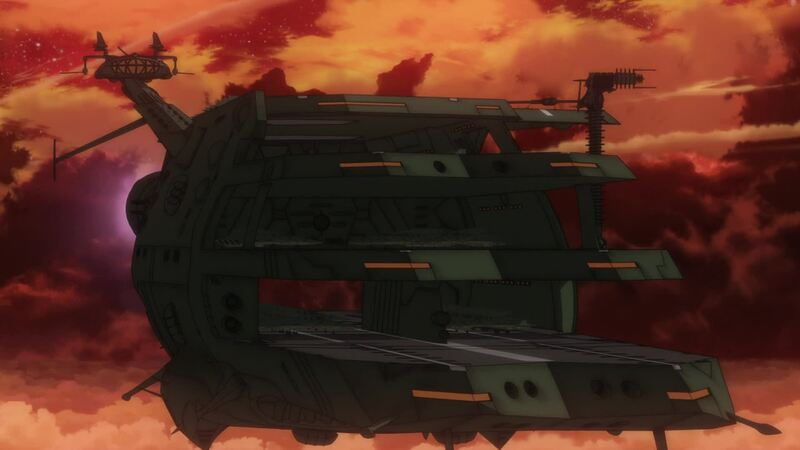 They’re followed closely by the Gelvades-class Astro Battleship-carrier Darold. Its captain, Doola Bareck, orders the ship to land and his crew to prepare to disembark. 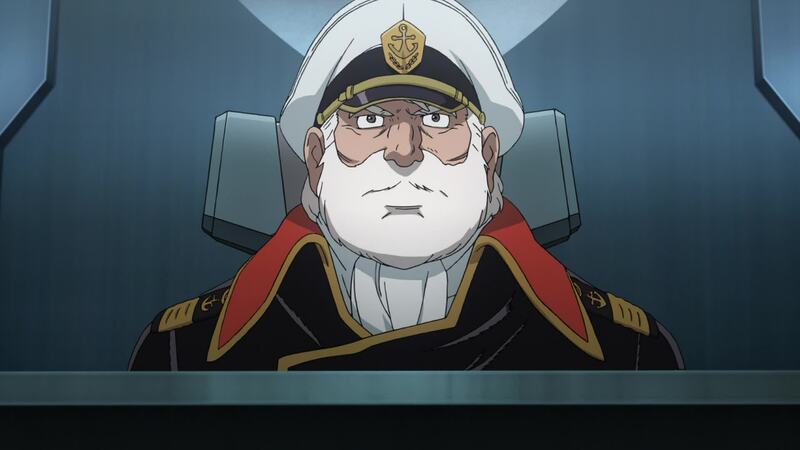 [DG]: Of course, Haidern was captain of the ship in the original series, as well as pilot of the drill missile ship. Since in 2199 he is serving as Domelaze III‘s captain, both of these roles have to be filled by others. The role of captain of Darold is taken by Doola Bareck. It’s quite a sight that welcomes Domel as he arrives at the base, with the four massive vessels lined up for inspection, alongside the less conspicuous UX-01. [LC]: Makoto Kobayhashi must have pulled some serious overtime in this episode. 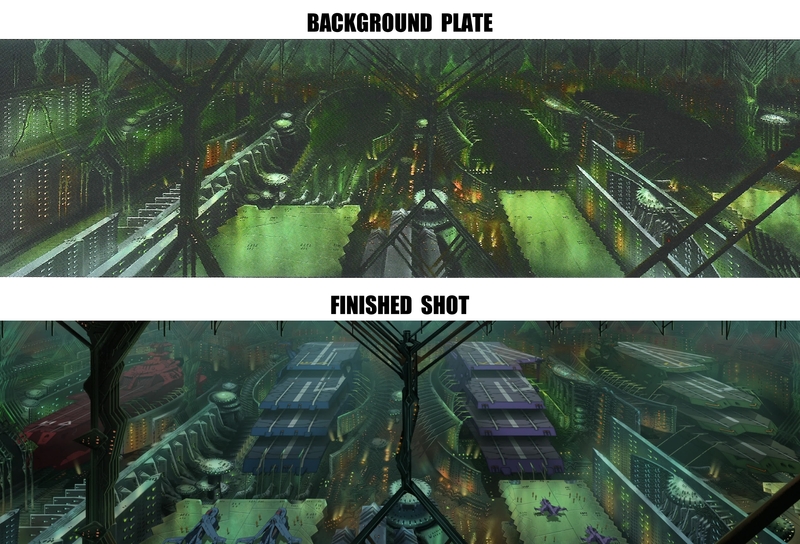 He has done some outstanding work with Garmillas, but these background sets are some of the most elaborate so far. Quite a stark contrast to the extremely plain backgrounds seen in the original. The lighting of a nighttime setting causes some of the fine detail to be obscured. I almost bet most viewers never realize the UX-01 is berthed next to Darold. You can see the clean background and ships overlay here. 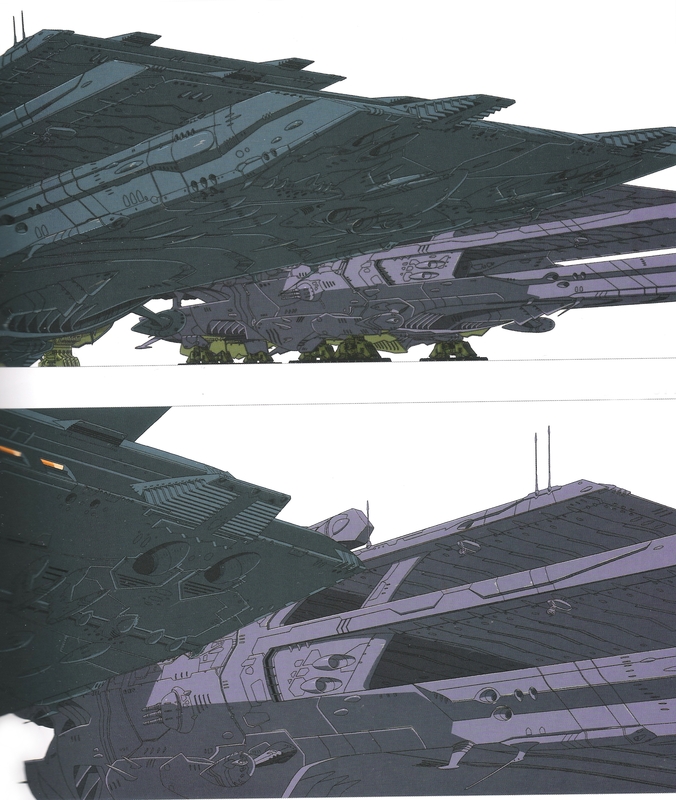 The upgraded designs for both ship classes are quite a leap from the originals, especially the boxy carriers which were basically the same ship design painted with different colors. The Guipellon-class are now not only more intricate in detail and shapes, but feature different runway configurations. For more background and details about both the Guipellon-class and the Gelvades-class ships, click here and here. [DG]: The landing pads’ criss-cross lighting almost gives the effect of the ships floating on water like oceangoing carriers. [LC]: Another person who must have done some overtime was mecha director Masanori Nishii. Even though they’re just background candy and mostly covered by the characters moving in front of them, the carrier hulls in the background are packed with detail. The “Detail-Up” technique at its finest. Click here for a taste of his amazing work. For even more of his work in this episode and others, check out this interview in the July, 2015 issue of Dengeki Hobby. Domel laughs as he remembers Hyss’ promise of giving him “the best crew.” Berger comments that they only got four carriers for the task force and Kraitz tells him not to complain. 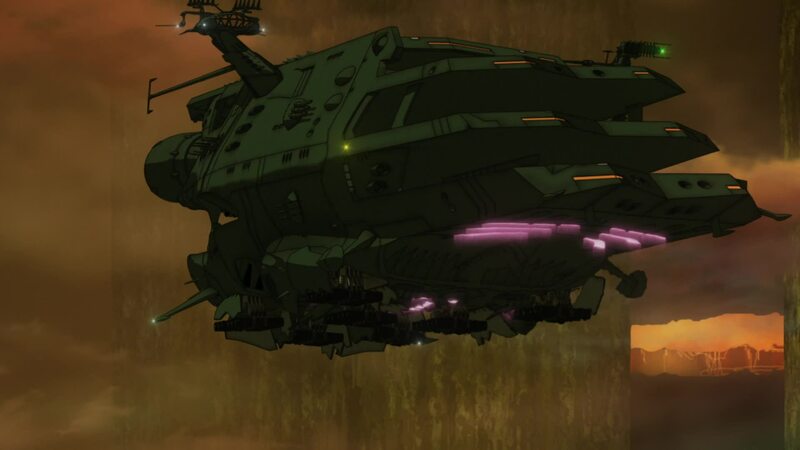 Ghetto says all that is left at Garmillas are the Homeland Defense Fleets controlled by the Imperial Guard, which wouldn’t give them more ships. Berger waves his arms in agreement, dismissing his previous remark. Haidern spots a familiar face among the ship’s crews, his old friend Vance Baren, who also is surprised to see him. Both joke that they didn’t think the other was still alive. Domel recalls that he last saw Baren in the Golni campaign. He asks the veteran soldier if he believes they can get the job done with only old ships and young men. Baren recalls that Domel once told him a soldier comes of age in the battlefield. Smiling, Domel says he’s counting on them. Baren salutes him. 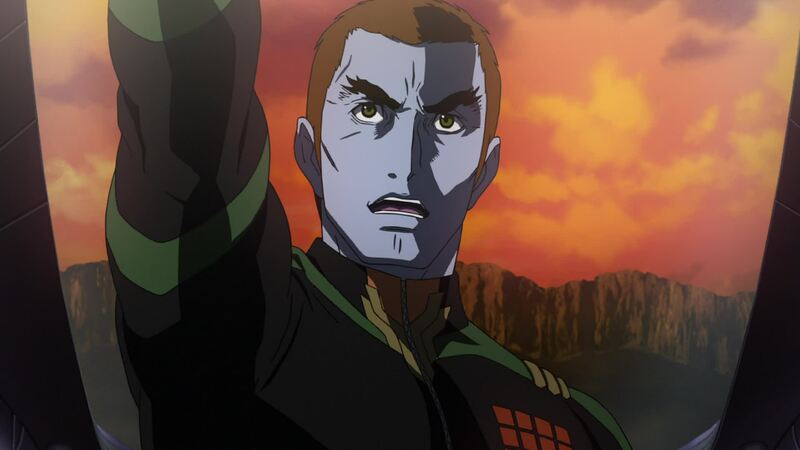 [LC]: Vance Baren takes over Haidern’s duties commanding the crew of Galunt, the heavy bomber that will carry the drill missile into battle. 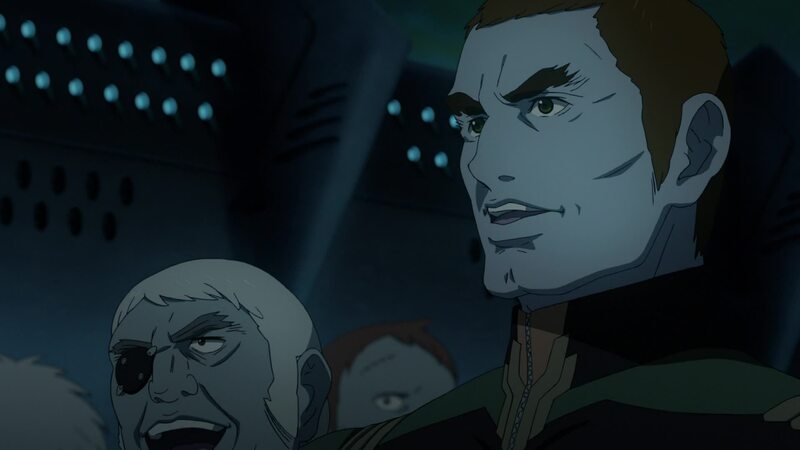 He holds the rank of captain and is the equivalent of 64 Earth years old. He’s an old friend of Haidern, having been a part of campaigns under Domel’s command. Berthed beside the behemoths, the small UX-01 goes almost unnoticed. Hainy orders the crew to attention. Domel tells Frakken he’ll need his help once more. Frakken smiles, commenting that the air in Baleras has become horrible, so he welcomes any chance to leave. 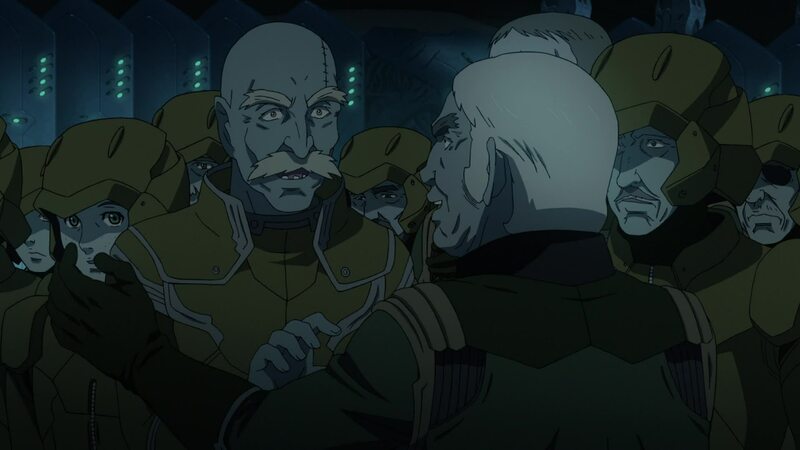 [LC]: Funny that even though his first appearance in the series was under Domel’s command, in Episode 13, this is the first time we actually see Domel and Frakken face to face. 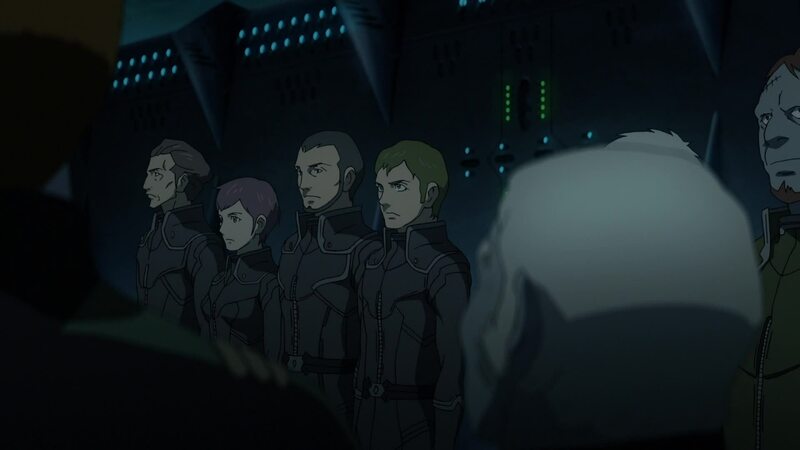 In the back, Berger’s attention is drawn to a group of four troopers standing by the UX-01’s crew, which Kraitz identifies as volunteers from Planet Zaltz. Berger is displeased to have soldiers from an occupied planet in the task force. Haidern leads Domel to them, saying they’re from the same planet as Schulz. Commander Gerd Bellger identifies their unit as the 442nd Special Platoon, Specialized Warfare Group B. Domel tells him he has a mission of extreme importance for them to carry out. Bellger says they’ll do all they can for Garmillas. [LC]: The commanding officer of the 442nd Special Platoon is Second Lieutenant Gerd Bellger. 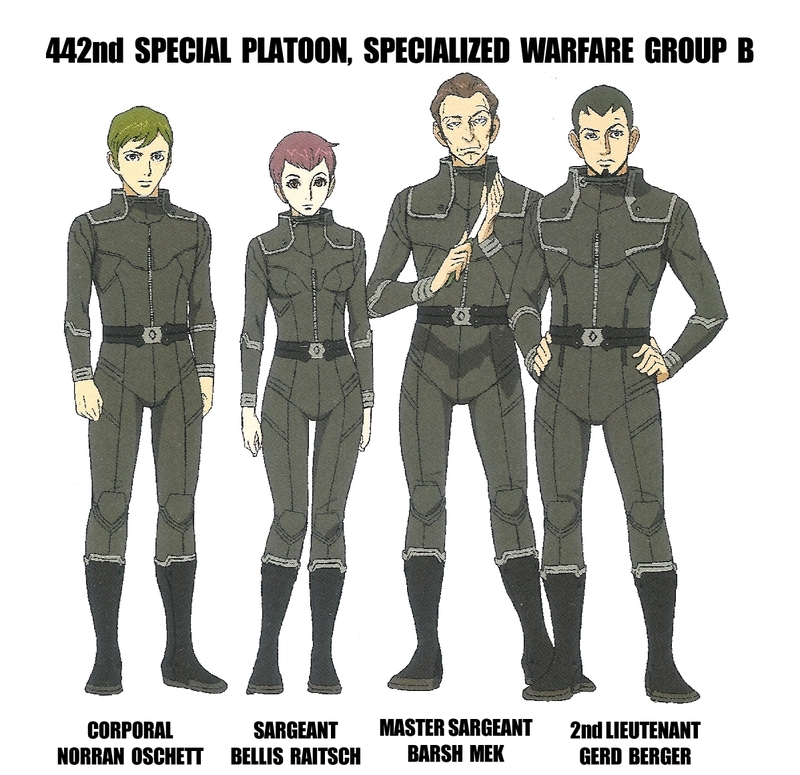 His team is formed by Master Sargeant Barsh Mek, Sargeant Bellis Raitsch and Corporal Norran Oschett. 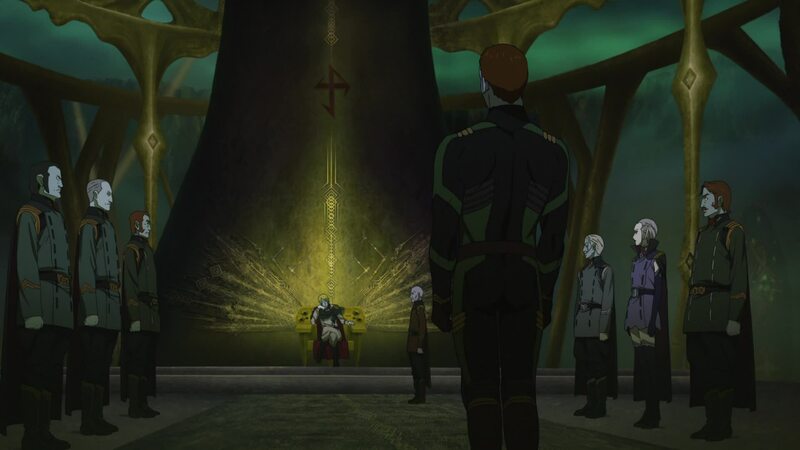 Norran will play a bigger role in things to come, something evidenced by his role in this scene. He is is the equivalent of 21 Earth years old. Click here for their group shot. Visibly annoyed, Berger says he’s not sure they can be trusted. An uncomfortable silence sets in. Norran, the youngest member of the group, looks around waiting for some reaction from his comrades. Hainy steps forward with a grin in his face, perhaps hoping a fight will break out. But nothing happens. 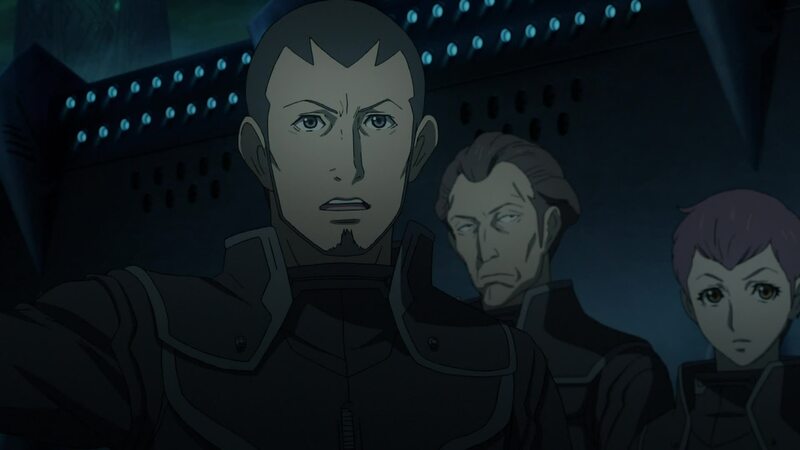 [LC]: Domel and most of his commanders don’t seem to mind working with Zaltzi, as evidenced by previous mentions of Shultz where Domel praised his service. The one exception is Berger, who seems to harbor some serious trust issues toward them. If any of his companions feel the same, they are at least better at concealing it. Silence lingers as the seconds roll by. 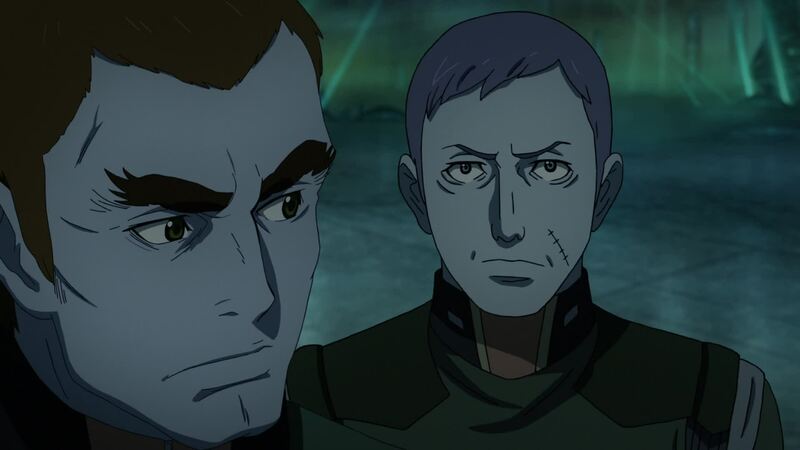 Domel looks at his young subordinate with disapproval, but Berger stands his ground. More seconds, more silence, until… A voice echoes proudly, singing the opening bridge of the Garmillas Empire’s anthem. Surprised, Domel and Berger look at the source of the singing. It’s Norran, who is quickly joined by his comrades. Berger’s jaw drops while Kraitz smiles. [LC]: This scene of the soldier singing a patriotic and inspiring hymn followed by his comrades seems to be inspired in a similar scene from the 1965 WWII movie, Battle of the Bulge. The scene features one of the main characters, Col. Martin Hessler, being introduced to the men that will crew his Panzer Division. Much like in this scene, Hessler complains “there are too many boys” among them. To show their resolve and devotion to the homeland, one of the young officers begins to proudly sing the Panzerlied, followed by his fellow officers and eventually even Hessler. 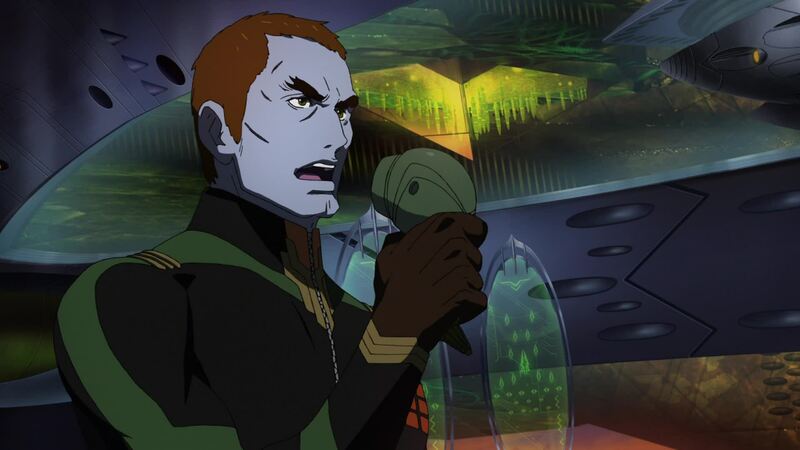 Hainy’s unwillingness to sing recalls that of Hessler’s aide, Conrad, who only joins when his commander orders him to. You can watch that scene here. [DG]: I found it disappointing that the majority of the lyrics to Praise Be Our Eternal Glory were actually in Japanese. I had initially thought that the anthem had been entirely written in Garmillan. To me, that would have been one heck of a level of detail to go to. 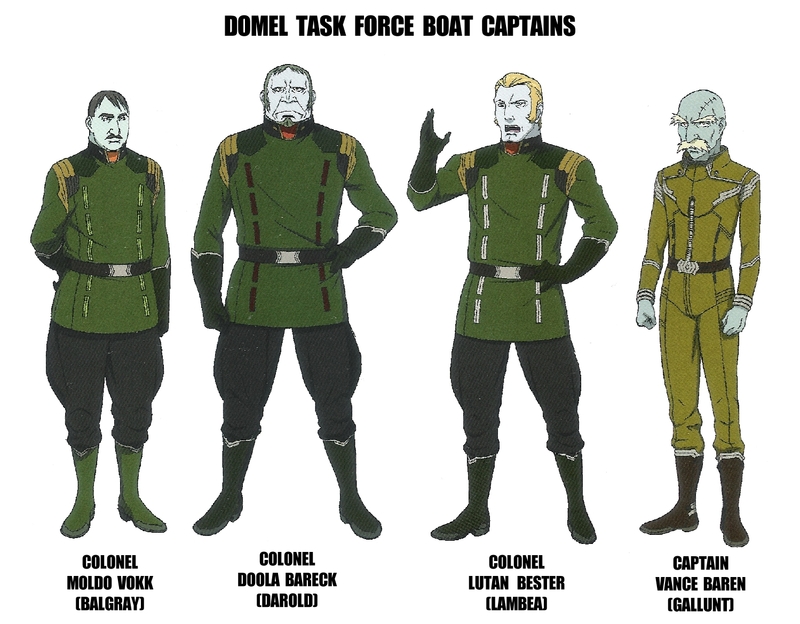 Domel joins in, followed by the rest of his commanders and ship’s crews. Even the usually-cold Frakken sings, leaving Hainy no choice but to follow suit. [DG]: Here we see that Domel treats all his men fairly, (almost) irrespective of race, color, or home world (he still seems somewhat derogatory towards the Jirellians, as we saw earlier). [LC]: Hainy’s reaction is priceless. Despite the difficulty of properly animating characters singing, they seem to have made an extra effort to make it look good. Nice bookend to the similar scene in Episode 1. “Praise Be Our Eternal Glory” echoes loudly and proudly in the night air. 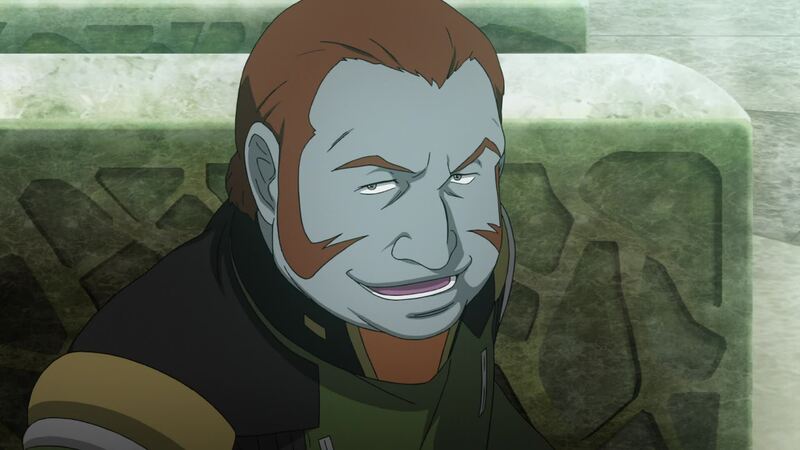 Alone in his private chambers, Dessler moves his pieces in the game board, a wicked grin in his face. Checkmate. 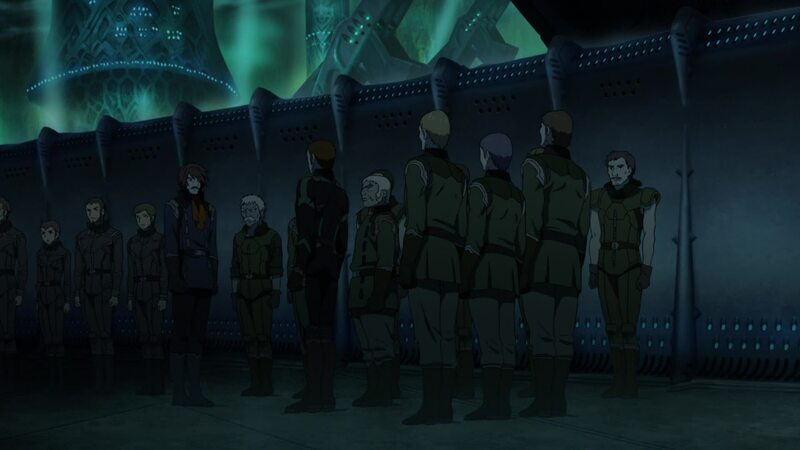 [LC]: Knowing who Dessler is playing this game with, this is not a good sign. And this grin here… I think you’re right, Daniel. That’s quite an insane look. Sing a song of joy! Praise be the triumph of our fatherland! A proud nation of steel! Okita is in the Wave-Motion Gun’s control room, looking at the weapon with concern. 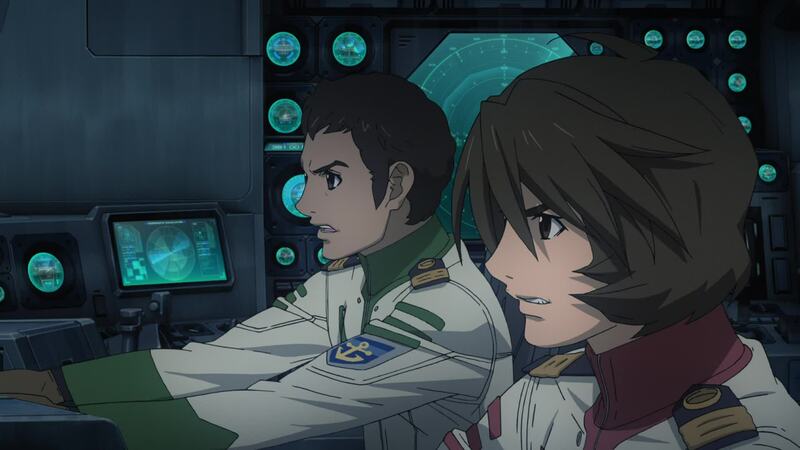 Nanbu comes around the corner with a technician, telling him to keep the gun in good shape, since it ensures Yamato’s invincibility no matter how many times the Garmillas show up. The tech notices Okita and Nanbu asks if he needs something. [DG]: Okita is contemplative again. Makes you wonder exactly what’s on his mind. Is it the hypocrisy of creating the Wave-Motion Gun despite this being a primarily non-aggressive mission? Is it the limited usefulness of the weapon? Is he even contemplating whether there’s a weakness that could be exploited in battle? Okita says it’s nothing, heading for the access hatch and leaving the two officers confused. As he steps out into the corridor, the captain feels a presence. He looks up and sees Yuri(sh)a waiting for him. Coldly, she says that what lies behind him is a tool of war. Later, in Okita’s cabin, he hands her a cup of tea. She tells him Wave-Motion Energy is not a weapon and that they shouldn’t have made it into one. Okita remains silent. She continues, saying the plans given to Earth a year ago were to enable them to cross the stars and take them to Iscandar. 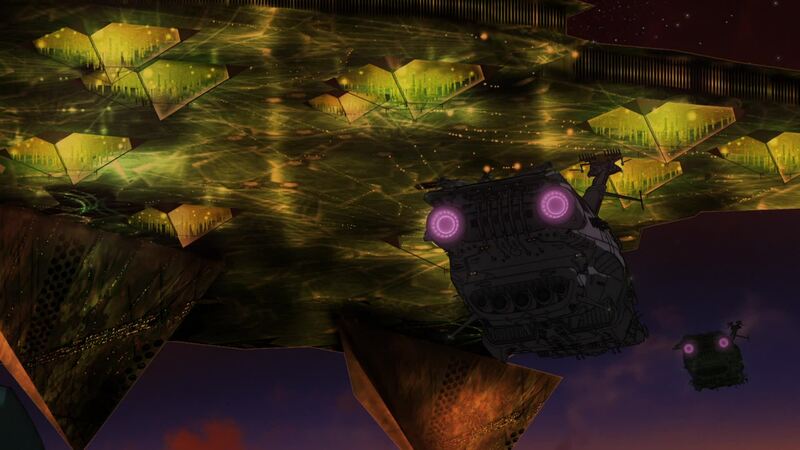 Okita tries to justify it, saying they required protection from the Garmillas during their 168,000 light year travel. 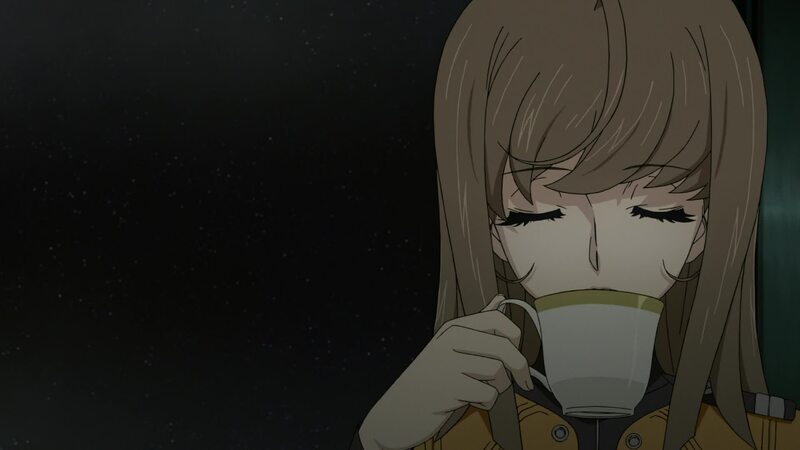 Yuri(sh)a takes a sip of tea and concludes his reasoning, saying that’s why Sanada created it. [DG]: It’s worth noting that there’s a timely look at the copy of Crime and Punishment, seen back at the end of Episode 16. What price should be paid for using Wave Energy to power a weapon? 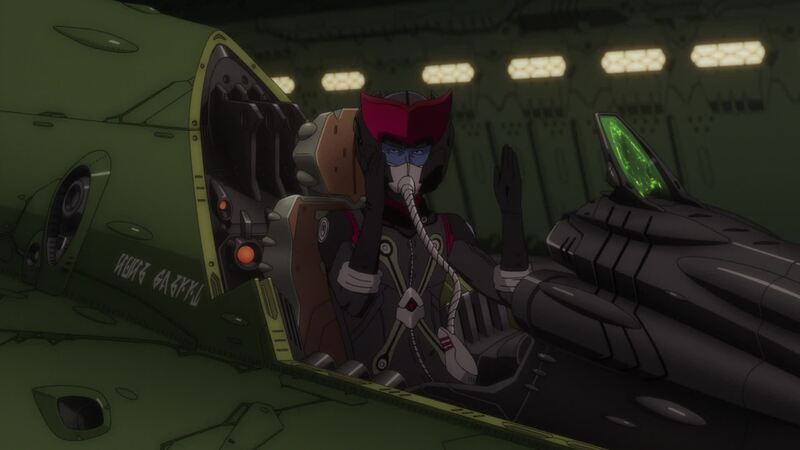 [LC]: This is a nice callback to Yuri(sh)a’s remark in Episode 15 about the creator of the Wave-Motion Gun. Though we were left dangling on that remark, here it’s finally confirmed the “he” that Yuri(sh)a aluded to was indeed Sanada. [DG]: Yuri(sh)a’s words here could be very far-reaching. She could very well be asking, you may very well be using it for self-defense, but what of the rest of Earth? After you return home and save your planet, what’s to stop them from making more of those weapons? 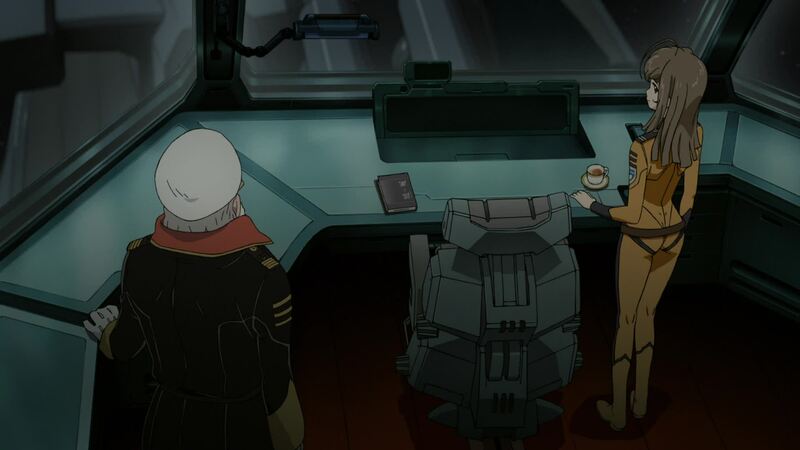 Yuri(sh)a sets the cup down on the captain’s desk and wonders why he hasn’t asked her yet why they didn’t bring the Cosmo Reverse System directly, instead of the plans for the Wave-Motion Engine. After a moment of thought, Okita proposes that perhaps mankind is being tested by her and her people. Though she doesn’t confirm it, Yuri(sh)a says her role is simply to observe. It’s up to her sister Starsha to decide. With new resolve, Okita tells her he hopes she’ll watch carefully. 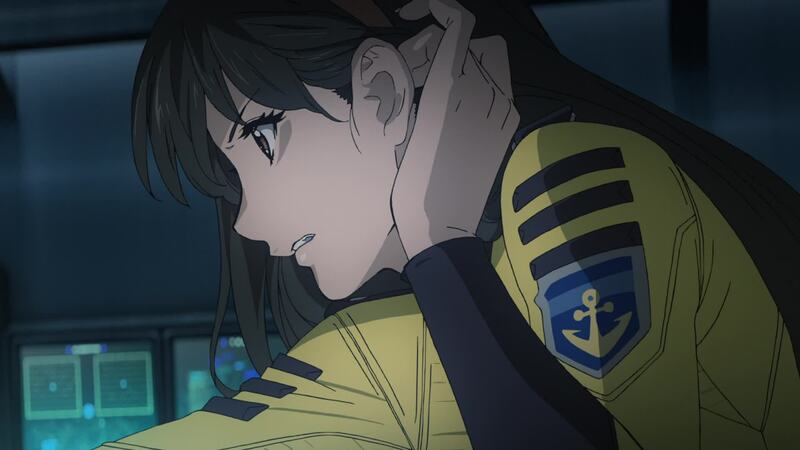 To see if Yamato – or rather mankind – is worth saving. [LC]: Yuri(sh)a finally turns into canon a question fans have asked ever since the original aired. [DG]: Okita verbalizes what I thought he already saw as the reason a few episodes ago; that the entire journey is a test of humanity’s resolve, character, and willingness to accomplish things without resorting to warfare. Throughout this scene, the wonderful background artwork of the Tarantula Nebula is visible. Nice to see they didn’t leave out their surroundings. Deep in the bowels of the Garmillas naval base, the Guipellon carriers are being loaded with aircraft and ordinance. Across from them is the Domelaze III. A crane lowers a large device into a connection port, attached to starboard plane of the bridge section, mirroring a similar setup on the port side. [LC]: Another stunning set piece by Makoto Kobayashi. Notice the loading system for the planes, forward of the Guipellons. Those platforms appear to be movable, probably moving forward until they bump into the runways in the hangar levels. Click the image on the left for the full pan shot. [DG]: There is fantastic detail here of the ships, the fighters, and so forth. The backgrounds are amazingly intricate. As we see the second SMITE projector lowered into its iconic place atop the saucer bridge of Domelaze, finally transforming the ship’s bridge into the iconic saucer ship from the original series, we see considerable detail all around the interior and exterior of the hangar – right through to the cranes we see through the opening in the ceiling. The original series never even dreamed of detail at this level. 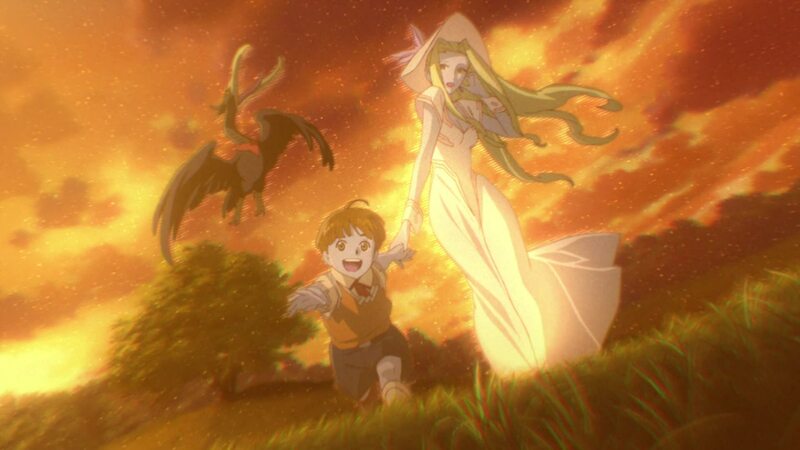 This is truly Makoto Kobayashi’s work at its finest; all the more impressive given how the turnaround time for the last eight episodes had been reduced by a third. This makes me wonder if he had help from the massively talented Hidetaka Tenjin (known for the detail he puts into his work for Macross projects) in getting these backgrounds finished. The operation is observed by Domel and Velte Talan from a nearby window. Talan says the device is a top-secret prototype, stating it wasn’t easy to convince the Weapons Research division to hand it over. Domel says he’s grateful and Talan responds that he’s used to his unusual requests. He does wonder why Domel would need such a thing. Domel’s response is a wicked grin. [LC]: And let’s not forget Masanori Nishii’s work. Again and again, he goes the extra mile to give us stunning mechanical visuals. This shot of the Domelaze is a fine example. For all the awesomeness we see through this window, there’s a lot more we don’t see. As we have reported before, Mr. Nishii is a firm believer in doing whole pieces, even parts that might not be visible in the shot. As he said, even if its not fully visible, the detail is there, the feeling is there. And it shines through. Click the image on the left to see this amazing piece and a bit extra. On the deck of the Darold, two crewmen make maneuvering signals, guiding a plane back into position. One of them wonders why an asteroid mining drill was loaded as a bomb. The other doesn’t know, saying he’ll never understand the higher-ups. The plane is then revealed as a massive bomber, carrying the afore-mentioned mining device. [LC]: The final pieces of the puzzle and another stunning piece of redesign, the Asto Heavy Bomber DBG88, named Galunt. And along with it the dreaded Drill Missile. The Galunt has a wingspan of 83.3 meters and a crew of 4. This type of craft is used in mining operations to deploy special mining projectiles. Galunt and one of these projectiles were refitted for this mission at Domel’s request. The colloquially-designated “drill missile” is 51.8 meters long and has a diameter of 7.2 meters. 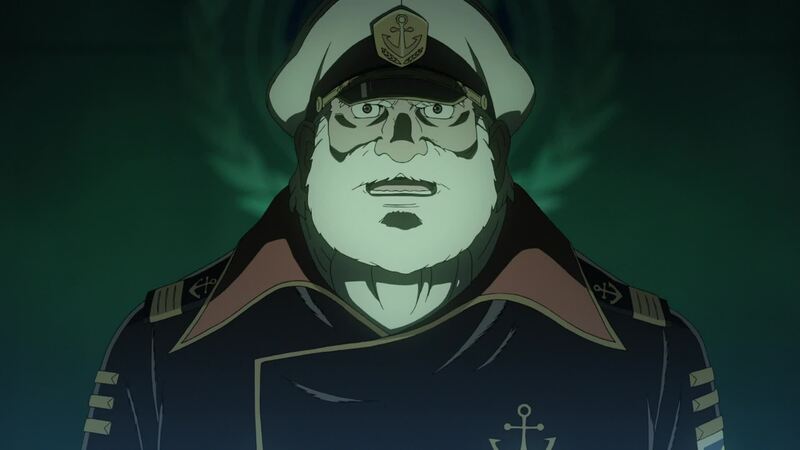 [DG]: Between Velte Talan’s questioning the value of the “acquisition” of the SMITE projectors from Research and Development, and the deckhand aboard Darold asking why they’re using a mining drill as a bomb, they’re really going all out on the exposition of how Domel will attack Yamato this time around. 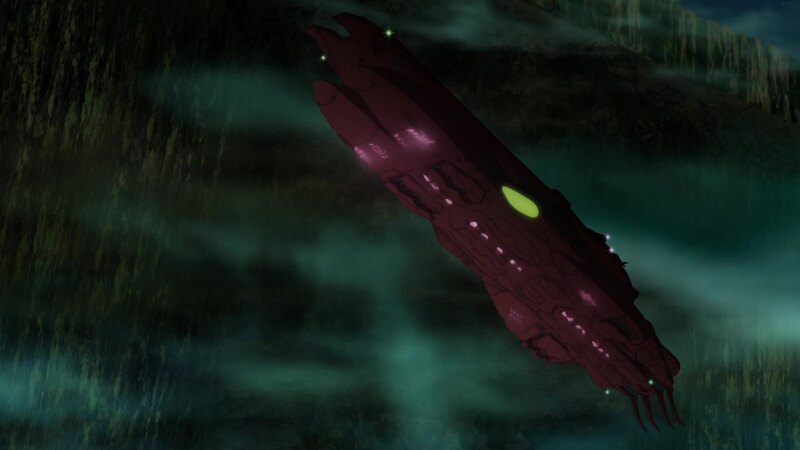 In the original series, the drill missile was purpose-built to deal with Yamato‘s Wave-Motion Gun, as was his saucer ship with the SMITE projectors. Here, they’ve spent half the episode showing Domel as a thinker, a man of vision and improvisation, making the most of very limited resources. 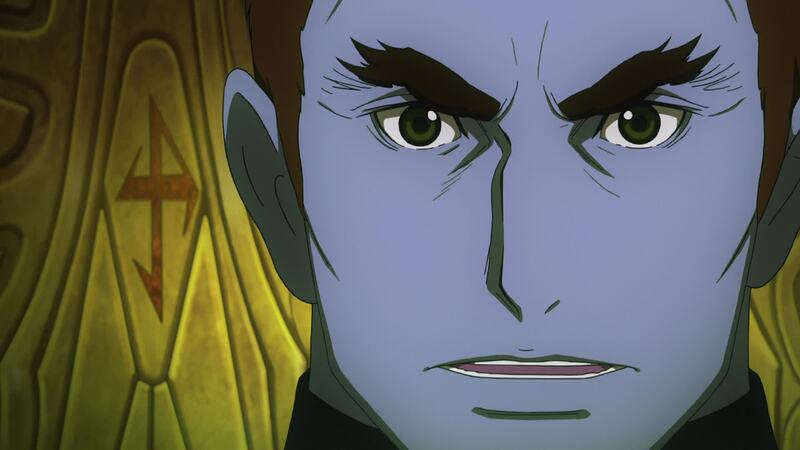 The story is more believable, and it really evolves Domel’s character compared to his original series incarnation. This particular shot stood out when I first saw the episode, not just because it’s stunningly beautiful but for another fun reason. 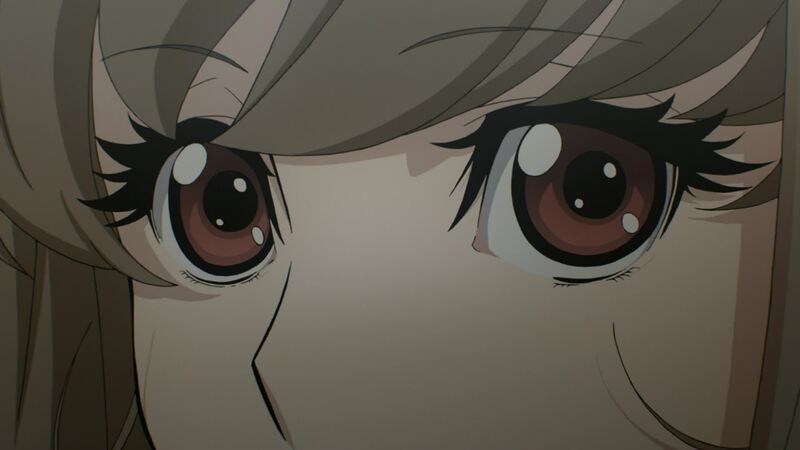 At the time Episode 18 came out, Chapter 6 was still in production. Therefore, some unfinished shots were used in the “preview” of this episode. This was one of them. And boy, did it evolve in the short few months between the two. From the much more detailed and imposing background to the added levels of mechanical detail, the difference is amazing. Click the image above right to see a side by side comparison. Melda Dietz arrives at Astro Fleet Command just in time to see Lieutenant Brigadier Kaulles Helder, one of her father’s aides, be taken into custody by the Imperial Guard. He tells his staff to remain calm, stating that any investigation will reveal he’s done nothing to warrant his arrest. 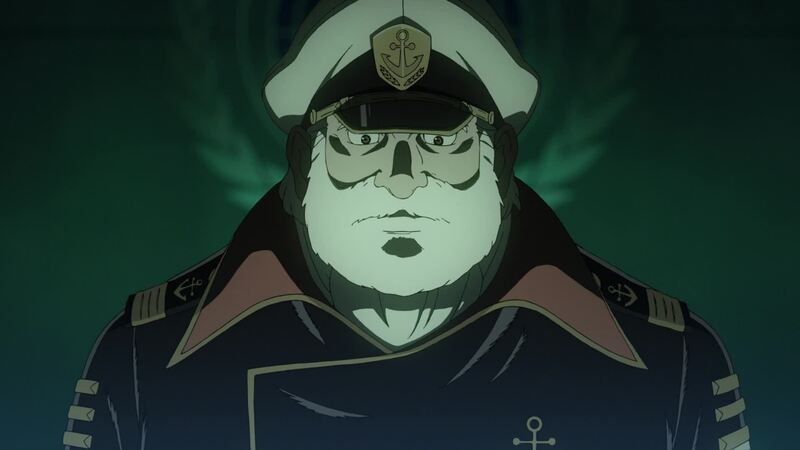 [DG]: And here we’re reminded that as Domel is preparing to sink Yamato, perceived enemies of the state are still being rounded up in the same city. Another probable translation issue: Melda to me says “ji-san,” which is a contraction of “oji-san,” a term of endearment toward older men in Japanese. However, the subtitles refer to his rank. It’s reasonable to think, knowing Dietz’s personality, that Melda would have a near-familial relationship with one of Dietz’s senior officers and justify the “ji-san” reference. Melda tries to intervene, but she’s held back by the two men that have been tailing her. They watch as the Guard ship leaves. Orto Dolmen says this is what’s really happening to the home they risked their lives to protect. Melda asks them who they are. Dolmen looks at her and asks her if she is indeed Lower Storm Leader Melda Dietz. Melda is surprised by how her day has turned out. Yamato speeds towards the Tarantula Nebula. 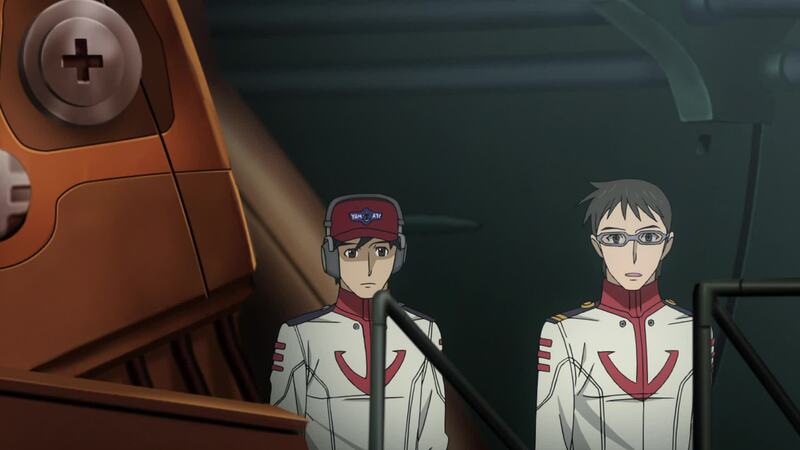 The command staff is in the Central Operations Room, where Sanada explains the dangers ahead of them. The area is filled with interstellar medium and ion storms. Shima shows them a map of the nebula, dominated by seven collapsing stars. For convenience, he names it the Rainbow Star Cluster. Going through it is the fastest course, but the collapsing stars and large amount of relativistic jets also make it extremely dangerous. [DG]: Shh. Sanada’s talking SCIENCE! And being accurate about it. Then, going by the subtitles, Shima starts spouting nonsense about how the seven stars make up the entire Tarantula Nebula. A Hubble Space Telescope study of the nebula shows that the nebula is 600 light-years across and contains over eight hundred thousand stars. As a side note, the NASA story linked above notes that stars have been forming in the nebula for only tens of millions of years, meaning the stars in the nebula are much younger than Sol. This misinformation about the cluster equating to the entire nebula raises all sorts of questions about Yamato’s maximum warp range. If we take the true width of the Tarantula Nebula (~300ly across), that would probably be pushing Yamato’s warp limits. It’s never mentioned what limits a warp distance, but the primary factor would be navigational accuracy and, going by Episode 3, strain on the ship’s hull and systems. However, if the spheres around the protostars are their gravitational influence, then as we saw back in Episode 15, their warp would be pushed off course by the path they’re taking. This would make warping any great distances in this area dangerous, let alone trying to negotiate the entire cluster in warp space. Shima goes on to say stars in the cluster are “degenerate stars,” but this would contradict the nature of the nebula. Degenerate stars are better known as white dwarf stars, which are the remnants of most main sequence stars (such as our sun) after they burn out, become red giants and supergiants, and then compress into white dwarfs. Since it normally takes billions of years for this to occur, this is completely antonymic to the nature of a nebula. In the end, I have to put this down to one of two things: either it’s a translation error (which given the subtitle quality in the rest of this episode would not surprise me in the least), or the writers got the science stuff totally wrong despite the presence of their resident astro-physicist Toshihiro Handa. Shima is obviously referring to the cluster rather than the nebula, and protostars rather than degenerate stars. 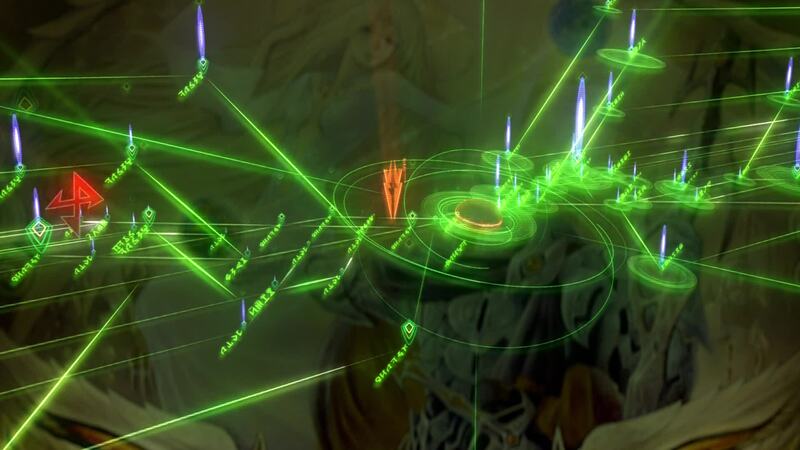 Yuki reports that the area is already interfering with the Cosmo Radar. Nanbu asks if they can warp through it, but Ota explains that the nebula is too big for them to cross, even at maximum warp. Kodai says it’ll be difficult to get through and Shima concurs, saying he has already charted a course around it. Okita looks at the map with a look of steely determination. Again, it’s a question of balancing some true science with what makes Yamato special. Even if something like the Rainbow Star Cluster doesn’t exist, its one of those things that couldn’t be taken out of the story. 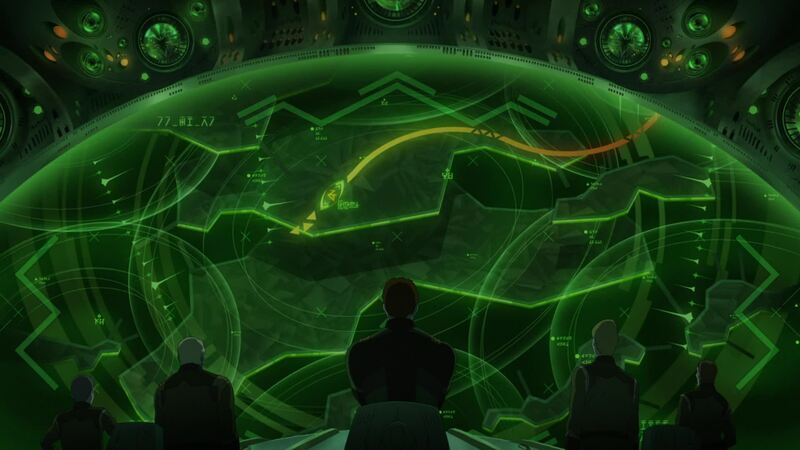 A map of that same area is being observed by Domel and his officers, showing Yamato’s projected course to the Salezar System. Kraitz notes that the quickest route is through the Rainbow Cluster, but Berger dismisses the notion, saying that would be suicide and they’re not that stupid. Ghetto adds that if they plan to avoid the Cluster, that doesn’t leave them many alternate routes. With the same steel in his eyes, Domel looks at the map before him. 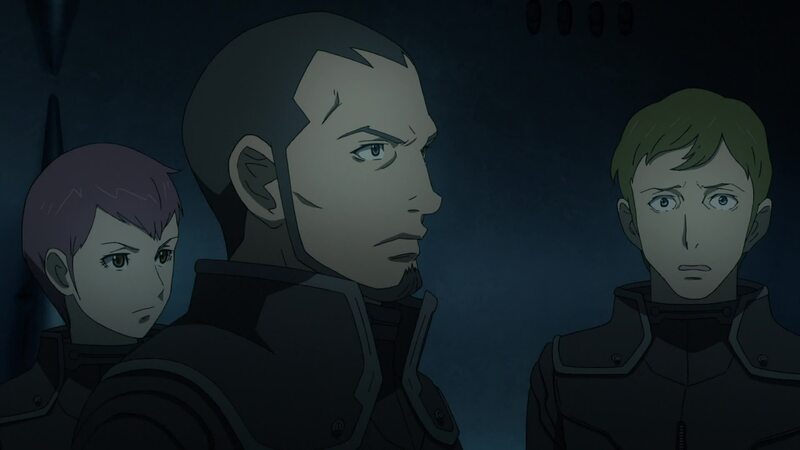 [LC]: Here we see the difference between a seasoned brilliant officer like Domel and a relatively young officer like Berger. 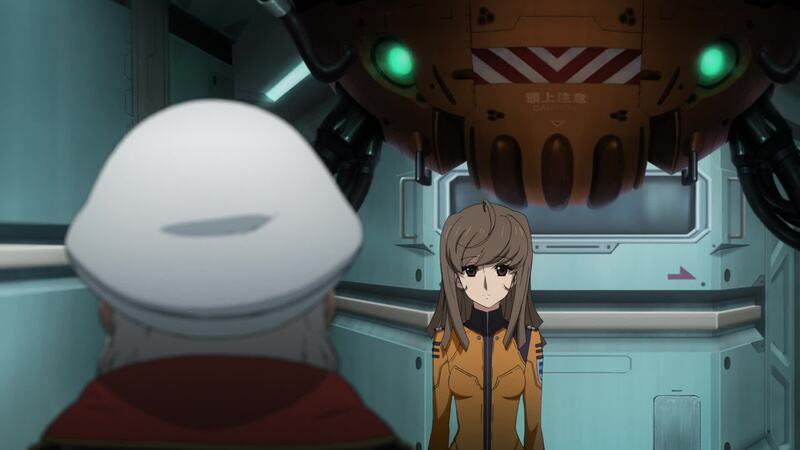 Berger dismisses the notion of Yamato crossing the Rainbow Star Cluster as suicidal. However, Domel has encountered Okita and knows he’s the sort of man to take that risk. To do otherwise would cost them their current limited advantage. It is a fortunate occurrence that Garmillas has only one Domel. “No,” says Okita. He realizes that even though they gained a step on the Garmillas at Balun, navigating around the Rainbow Cluster would give the enemy enough time to mount a counterattack. Sanada adds that it is unlikely the enemy expects them to go through such a dangerous area. It is decided. Okita says they will go through the Rainbow Cluster to Iscandar. As they travel though the cluster, an alert status will be maintained and surrounding air space scanned for enemy sentries. 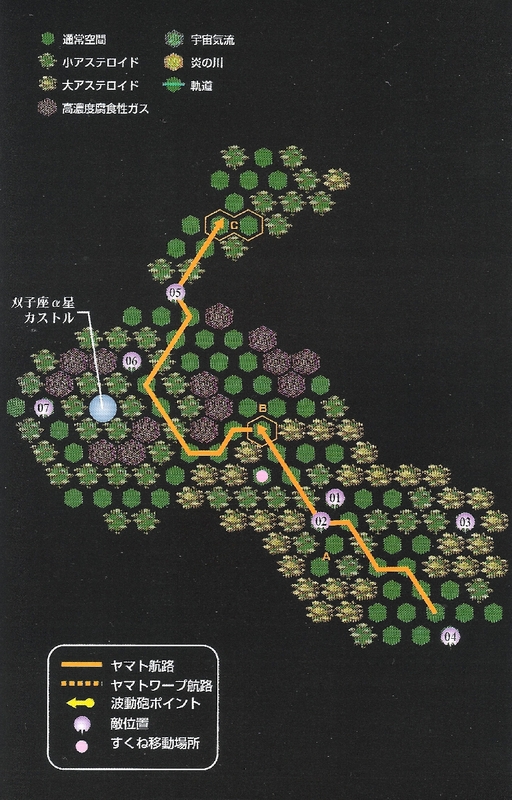 [DG]: They’re offering a much more logical setup here – rather than agree to meet the enemy in an area set up to the enemy’s advantage, they’re taking a calculated risk to take the fastest path through the area. [LC]: Indeed, if your mission is to get somewhere to save the whole human race, you’re probably not going to risk meeting the enemy head on, especially on their own terms. Sure, the original made this sound like a good idea, driving the notion that facing them head on was somehow equal to defeating the Gamilas and ensuring the success of the mission, which was really not the case. This setup is a lot more realistic and in line with the “avoid the enemy at all costs and fight only when necessary” theme that permeates 2199. 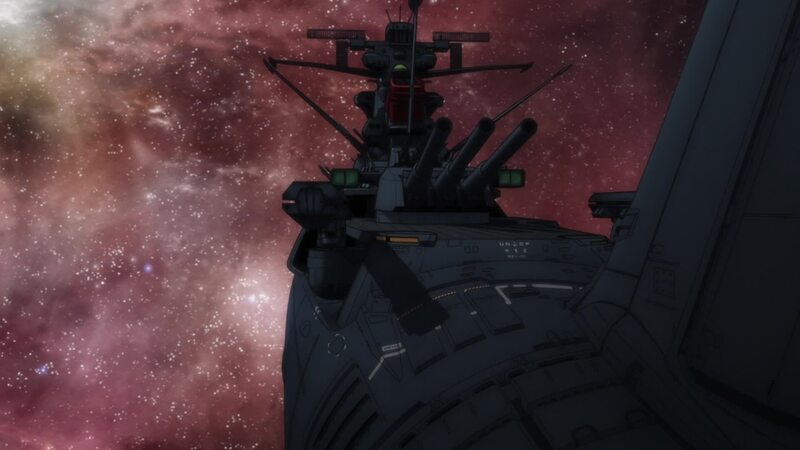 Okita risks running the gauntlet that is the Rainbow Star Cluster for quite logical reasons; to maintain the lead they managed to secure at Balun and because it’s something the enemy may not expect. At the same time, he knows there’s a chance that the enemy commander might be the one who nearly defeated them at Carell 163. If the strategic brilliance demonstrated there was not a fluke, he will figure out Okita’s move. So Okita prepares for this contingency. As for Domel, he has the upper hand. He knows who the enemy commander is and what he’s capable of. And exactly because of that, as Okita predicts, he manages to guess his next move and plan accordingly. Also, Domel demonstrates great improvisational skills when confronted with limited means. He uses what he has at hand to plan his strategy. And overall, these elements make for a much more believable setup for the major battle of the series. Domel examines a hologram with longing. He disengages it and looks at the map in front of him with determination. He makes a fateful decision. [DG]: Domel has thought long and hard about his opponent. We almost certainly have confirmation here that the Domels only had one child together, as we extrapolated in Episode 13. [LC]: Mr. Habara made these scenes a veritable piece of storytelling art. 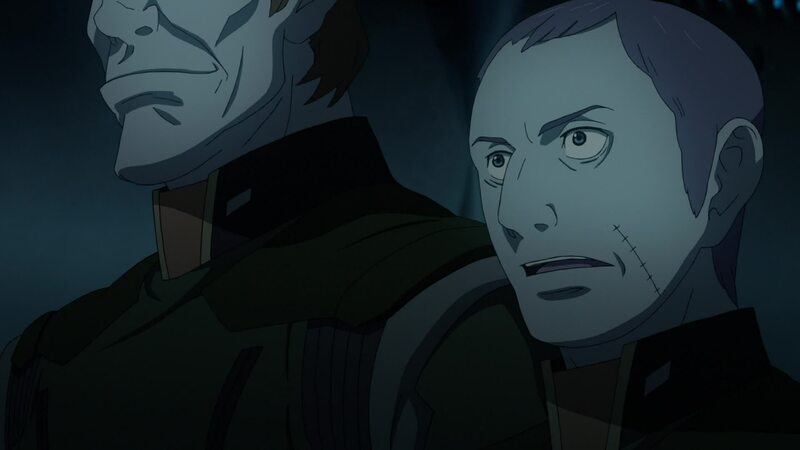 2199 has gone to great lengths to show us that the Garmillas are no longer the stock villains they were in the original, evil scheming bastards that just want to kill us all and rule the universe. No, they’re basically the same as us. More advanced, for sure, but they are human in the broadest sense. They have families and loved ones. They have honor, pride and even love. They fight to defend their home. The one thing that makes them a “villain” is the fact that they’re attacking “us,” that we’re on the receiving end of the equation of war. Domel and his men, and those before them, are soldiers following orders, not nefarious monsters who seek to destroy us just because they find pleasure in it. 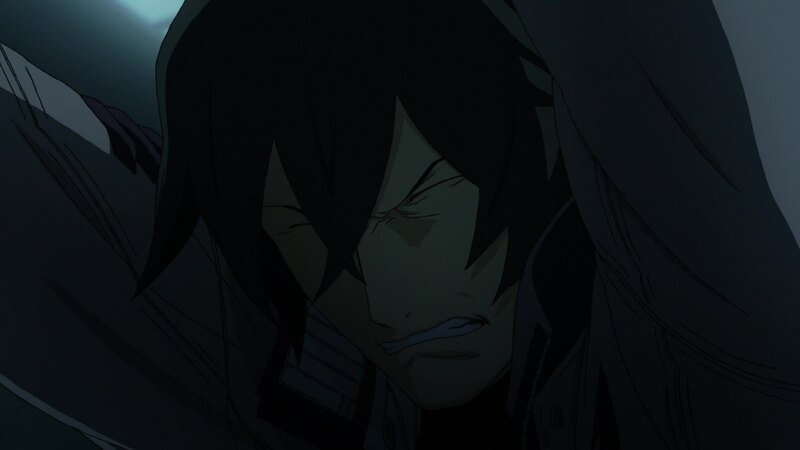 Even Dessler, maniacal and delusional as he’s becoming, has a motivation and believes he is doing what is right. The old saying “What unites us is greater than what divides us” is amply shown in the following scenes, in which the actions of each side are shown almost mirroring each other. Okita and Domel, above all, are shown to be quite similar. Both are brilliant thinkers who take the strategy of war quite seriously. They know their leadership and the choices they make have consequences in the lives of those who follow them, the ones on the front lines who will be risking their lives. The way they both anticipate each others’ moves shows their strategic brilliance. Both also share tragic pasts. Both lost their sons and still feel the pain of that loss. The juxtaposed scene of both looking at the photos of their long-shattered families is particularly poignant. Such back and forth between both sides is used quite effectively through the rest of the episode and makes for some of the best moments in the series. Okita looks at his watch, showing 9 minutes to warp. He looks at the family photo in his desk before lowering his command chair to the main bridge, where all officers stand to attention and salute him. Okita salutes them and looks ahead. [DG]: The parallel here is awesome, showing that essentially there’s not much difference between the two sides’ leaders. [LC]: This scene of Okita descending to the bridge with the crew saluting him is also a much better and simpler setup than having the entire crew meet at the gigantic mess hall and toast to victory with sake. Oh, sorry “spring water.” Again, as much as that scene fits the original and I actually loved it, you really don’t want your crew drinking alcohol before an important battle. Not to mention the lingering question of where the hell all that sake came from. The sun is rising over Baleras, bathing the naval base in a shimmering golden light. But this day, all attention is turned to the five giants assembled in the vast launch area. One by one, the ships in Domel’s task force report that they’re ready to launch. [LC]: Another way to “humanize” Garmillas is through the planet itself. 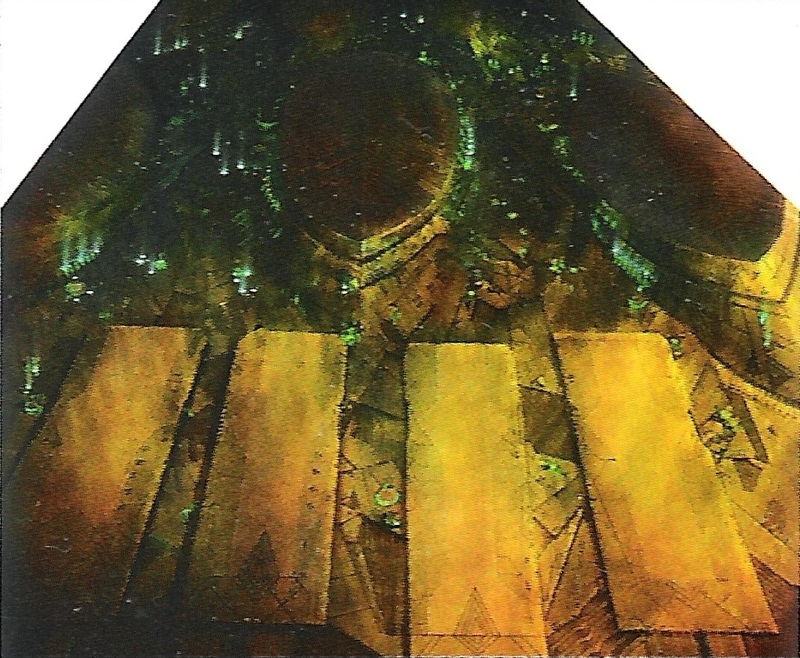 2199 has already shown us that Baleras is a much more diverse place the original, where Gamilas seemed to be in a state of permanent darkness, lit only by some eerie light source within the planet itself. Seeing Baleras in daylight makes it seem like a real city on a real planet, not just the gloomy lair of an evil empire. 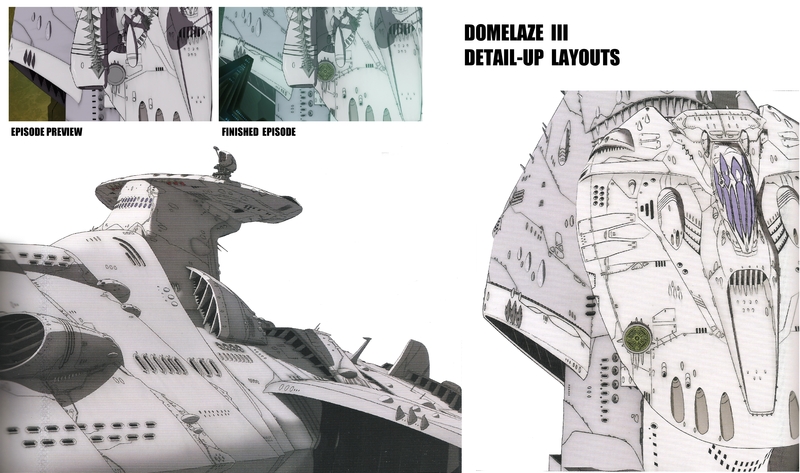 For all the design upgrades that Domel’s task force received, the most obvious is Domelaze III herself. This is where she was born in the original, as the purpose-built saucer shaped SMITE ship. That served as the base to create the much more imposing Dreadnought before us, now fully realized with its SMITE projectors. She has served Domel well. Haidern informs Domel of the fleet’s readiness and the general gives the order: “Launch all ships.” Balgrey takes the lead, its lumbering hull rising skyward as the massive landing gears retract into the undercarriage. [DG]: The detail of this scene is incredible, between the rising sun, the surroundings of Baleras, and the structure of the planet. Simply breathtaking. Like the original, the Gelvades and Guipellon-class ships have wheeled undercarriages for landing. 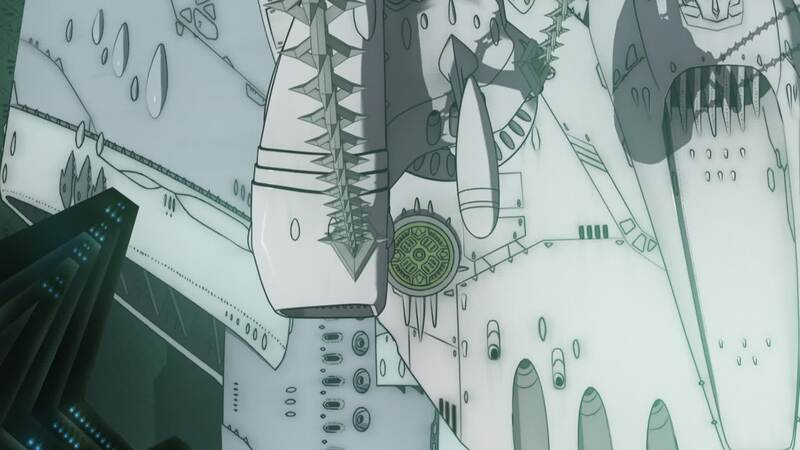 Looking at page 61 of the Space Battleship Yamato 2199 Garmillas book, there’s good detail of the undercarriage specifically. It’s thirteen meters high and the wheels are roughly two meters in diameter. Each undercarriage unit has two sets of three rows of wheels on either side of the main undercarriage leg, with either three or six wheels on each row (hard to tell which, due to the size, but it appears there are two tires per spar with two separators per row). 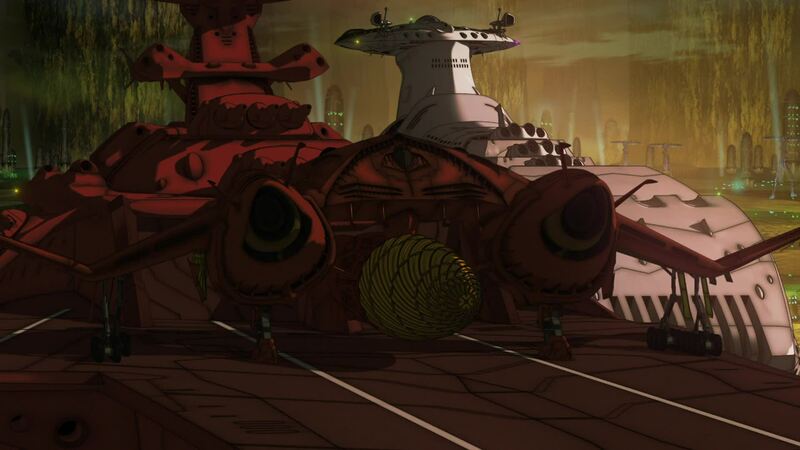 This time around though, I think the use of wheels is, on some level, meant to illustrate the age of these ships compared to the Domelaze‘s landing feet. Makes me wonder if they ever used them to move these behemoths while on the ground. Can you imagine taxiing one of these things? I imagine their usefulness would be limited to hauling them into drydock or a hangar, but what kind of horsepower would you need behind any vehicle or winch to pull a ship that’s over four hundred meters long? It is soon followed by Lambea, Schderg and Darold, with the massive Galunt perched on its deck. Finally, they’re joined by the gigantic Domelaze III. 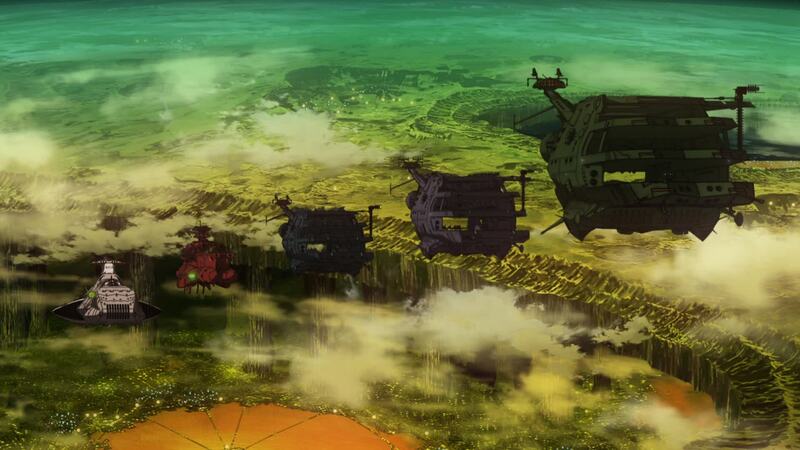 The fleet leaves the capital city of Great Garmillas behind, gleaming in the morning sun. [LC]: Dude, we’re talking about fictional space faring boats which can generate enough energy to warp space. I’m sure mustering the energy to move one forward on the ground is not a hard thing for them to do. As for steering… yeah, that would be tricky, but we have ever-increasing planes with large wings rolling around airports all over the world and they manage. If they use any type of towing vehicles, what I stated above still holds true. HP mustn’t be a problem. Traction might. A small vehicle pulling a beast like these, no matter how much HP it has, will have a hard time. Unless… anti gravity? Hulls made of strong, lightweight materials? 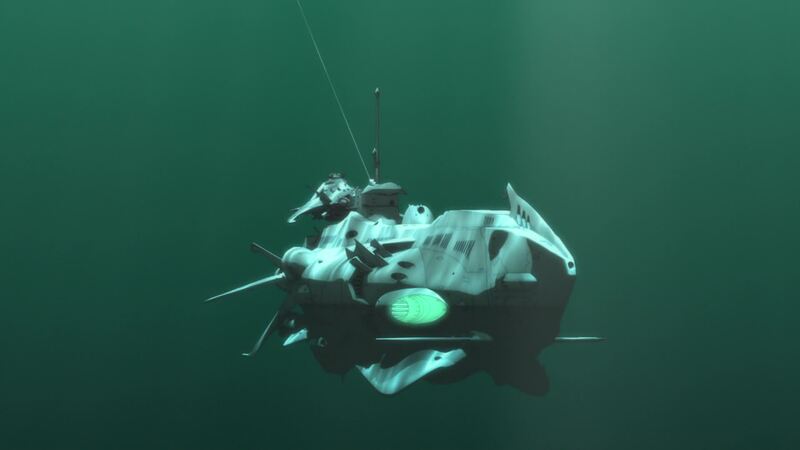 These are just a couple of fictional over-technologies that can decrease a ship’s relative mass, allowing easier manipulation by exterior means. 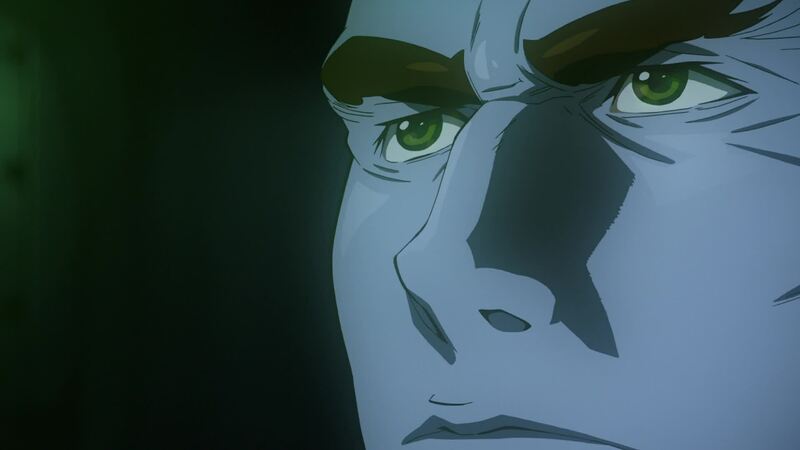 Part of this sequence also appeared in the episode preview. Instead of the orange skies over Baleras, it featured a plain star background. Click here for a side-by-side comparison. As they climb toward space, a shadow is cast over their hulls by something that dwarfs even these lumbering giants. Aboard the Domelaze, one of the crew announces the fleet is passing New Baleras. Ahead of them floats the unbelievable city-sized structure of the future Garmillas space capital. 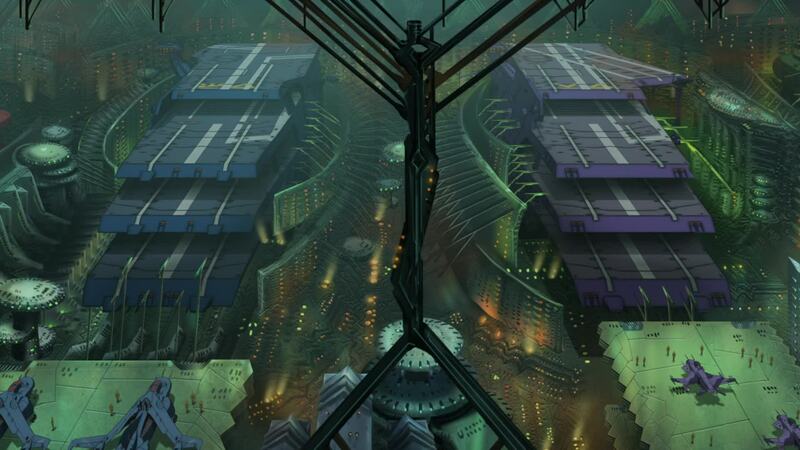 [LC]: New Baleras is based in a rough design of Dessler’s palace from Yamato III which impressed Mr. Nishii. That design was originally drawn by 2199’s general director Yutaka Izubuchi. Upon seeing this new set, fans immediately began speculating if it would be the site of the battle of Garmillas, instead of Baleras. As we’ll see when that time comes, they were half right. As they clear the city, Domel addresses the fleet to announce their course. They will follow course 728, toward the Rainbow Star Cluster. His officers’ reactions range from Ghetto’s surprise to Kraitz’s quiet acceptance to Berger being downright pissed. 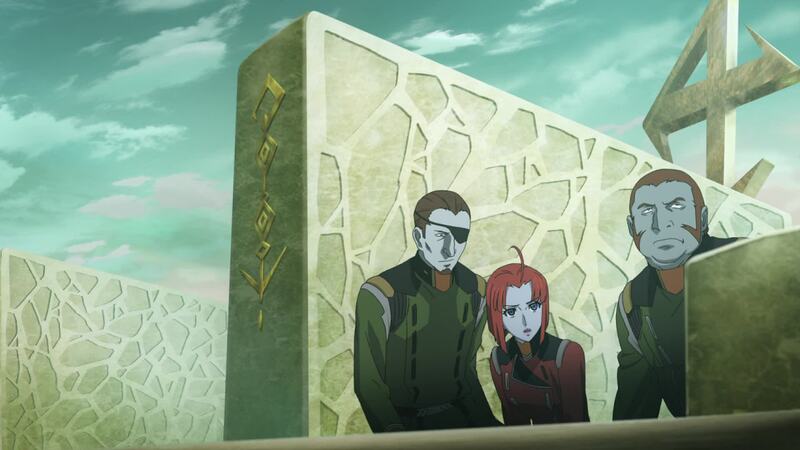 Haidern wonders if Yamato will risk going through such a dangerous area, but Domel is certain. 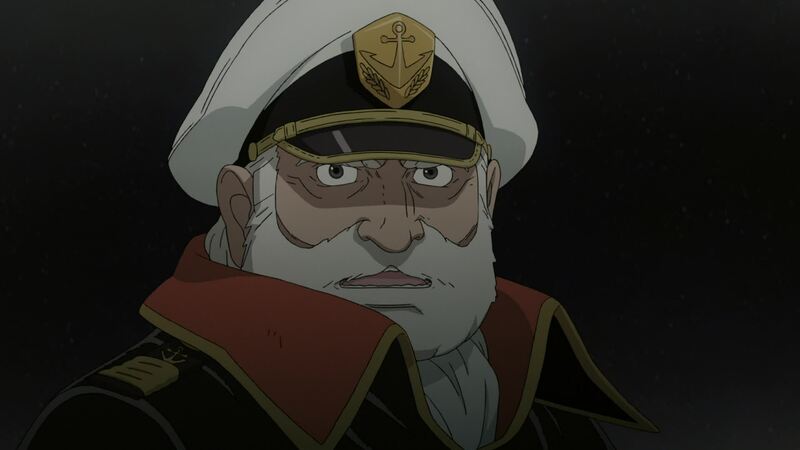 He says that if the captain of Yamato is the man he thinks him to be, he will risk it all. 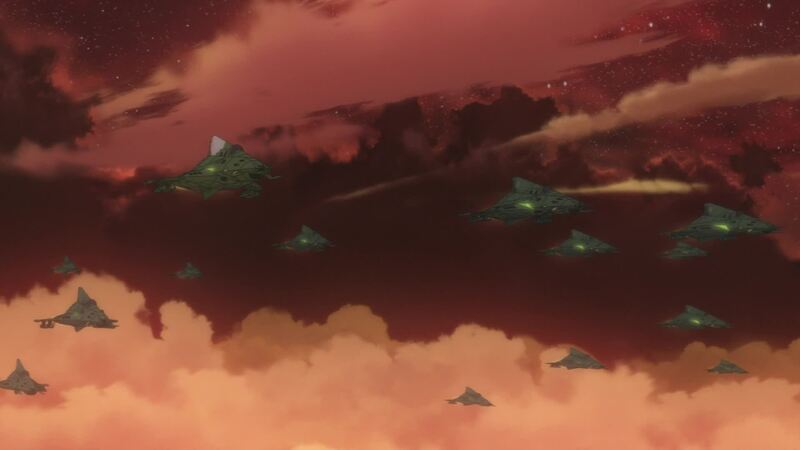 Moments later, the fleet goes into Geschtam Jump toward their target. [LC]: Berger’s reaction follows his previous remark. As far as he’s concerned, Yamato will not dare to cross the Rainbow Star Cluster, and going there will be a waste of time. Still, he’s been under Domel’s command long enough to respect his orders and do what he’s told. 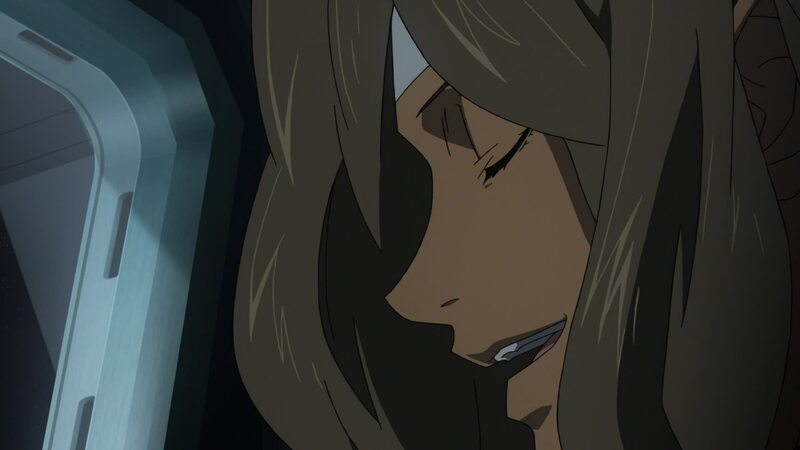 Also, his attitude has more to do with having to admit he was wrong once again when Yamato does turn up. Berger still has a lot to learn. 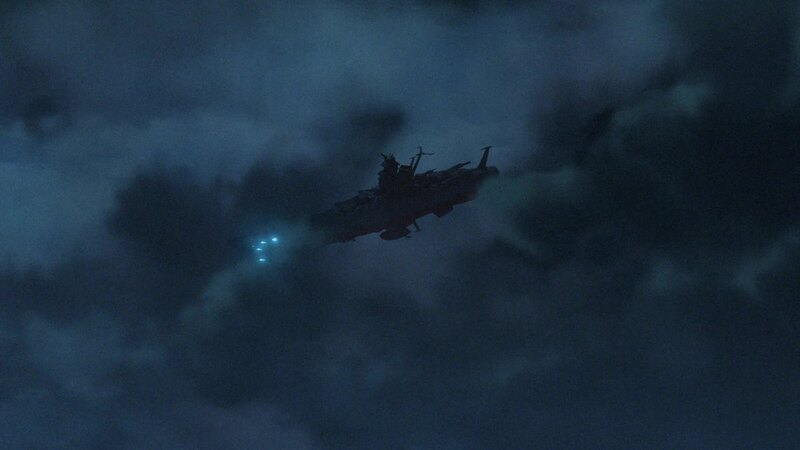 Yamato warps out in an area filled with gas clouds, the turbulent skies bathed in blue light and continuous energy discharges. Shima struggles with the controls as Ota reports they’ve warped into a pocket of high-density ionized gas. 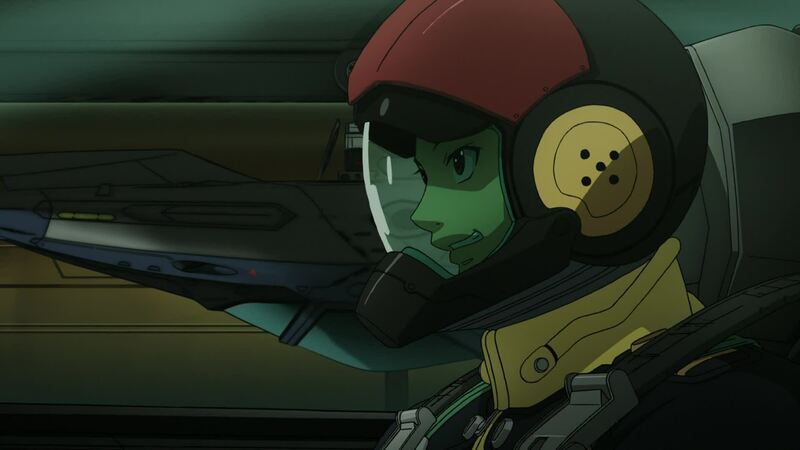 Shima switches the helm to manual to level the ship. [LC]: Right from the start, there is a stark contrast between the original Rainbow Star Cluster and the new. The original was little more than a colorful background for the battle, jamming Yamato’s radar and providing some place to hide temporarily. This one immediately becomes part of the narrative as a third party of the upcoming battle; a place that will destroy those who are careless and don’t respect their surroundings. 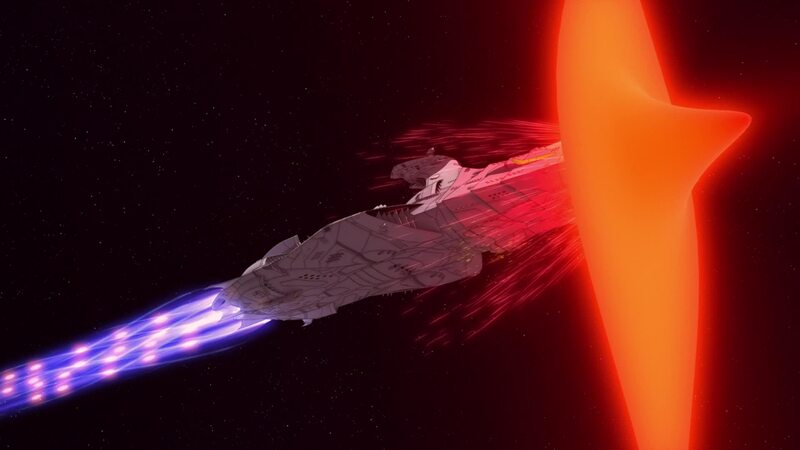 Yamato warps right into the middle of a storm, probably because it reached the previously-mentioned warp limit or because something in the area caused it to warp out prematurely. Whatever it was, they are now forced to navigate “rough seas,” a fitting way to begin a battle that plays more as naval warfare that a battle in space. Miki Saijo announces that radar and sensors aren’t working correctly, switching the system to optic mode. Shima is worried they’ll have to rely on optic mode to navigate, with Kodai saying they’re like an old sailing ship. As the ship struggles to move forward, Okita is immersed in thought. He thinks of the enemy commander they faced before. If he is the one sent to hunt them… they’ll run into trouble. 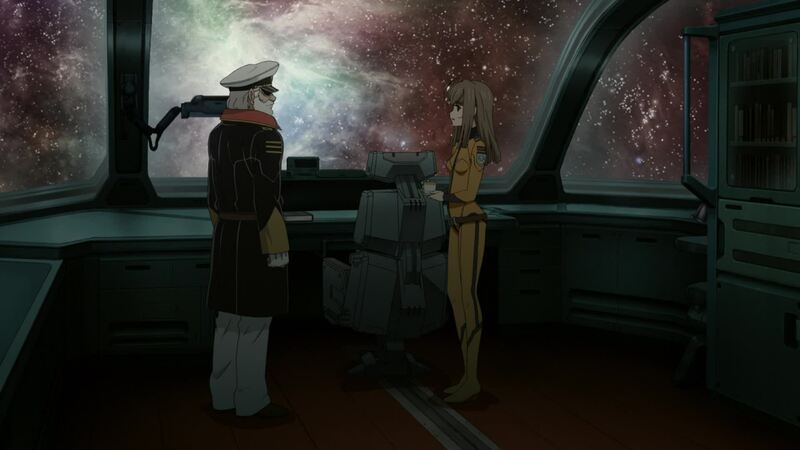 [DG]: The color and environment of the cluster really give it the atmosphere of a surface naval battle – and the impression of something akin to the weather conditions encountered during Operation Ten Go in April 1945, when Yamato made its suicide run toward Okinawa; an analogy Kodai makes for himself in the dialogue. [LC]: Why is Miki Saijo in charge of radar instead of Yuki Mori? You’d expect Yuki to take over radar operations for such an important operation. Given the benefit of hindsight, we know the plot needs to have her somewhere else in order to set a future plot thread in motion. But a little line of dialogue here to explain it would have been great. 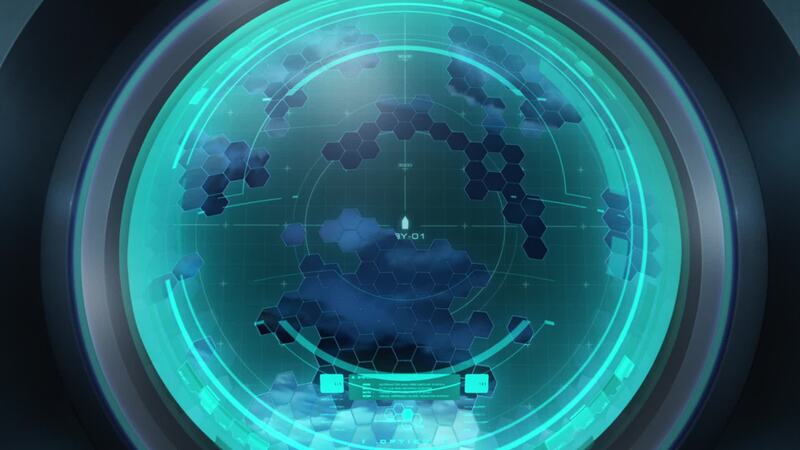 The radar graphics in optic mode could be an homage to the game-play of some of the Playstation games, which featured a similar beehive layout in the ship navigation boards. Submerged in the subspace boundary layer, the UX-01 lies in wait, its periscope peering into normal space. Frakken comments on the storm “above” them. Kiel reports that he’s detected a ship at 9 o’clock. 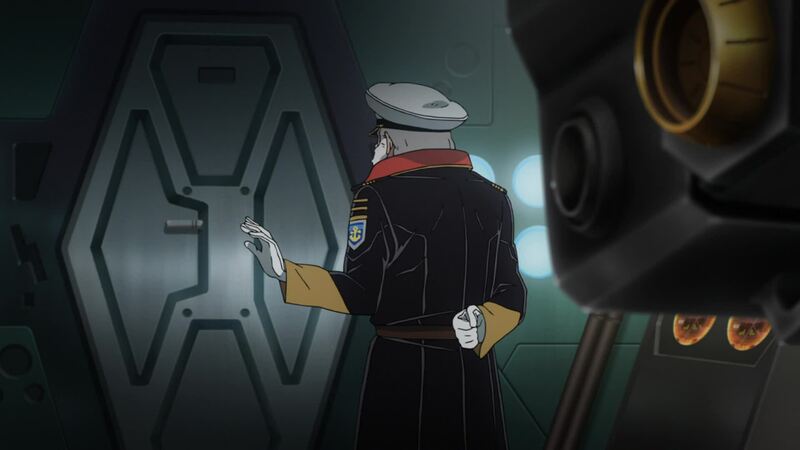 Frakken turns the periscope and makes visual confirmation of Yamato’s presence. [LC]: UX-01 is actually perfect for this scout mission. Not only can it sneak up to Yamato unnoticed, it also manages to avoid the nasty weather “above.” The continued use of naval analogies is far from innocent. Also of note is the FS Strike Boat docked with it. It will serve a nefarious purpose in the following episode. 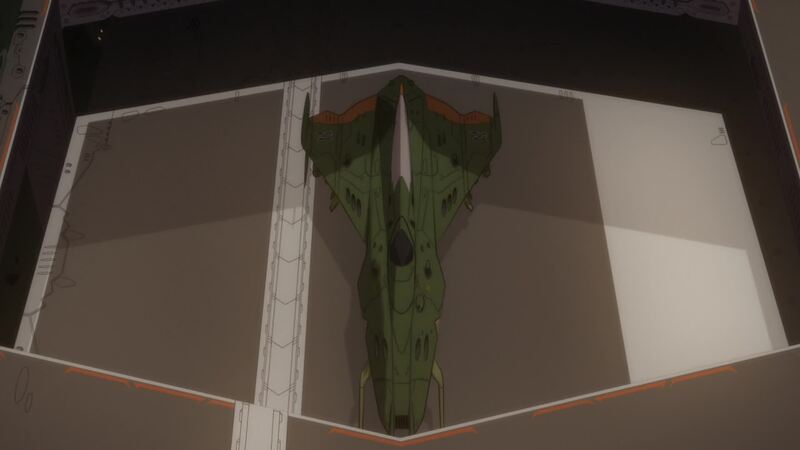 It also tells us that UX-01 has the capability of submerging other craft into the dimensional boundary layer, though we must assume that capability is limited. But a small craft like this doesn’t seem to pose any difficulty. The Domel task force is in a rather calm orange-lit sector near the cluster’s boundary. 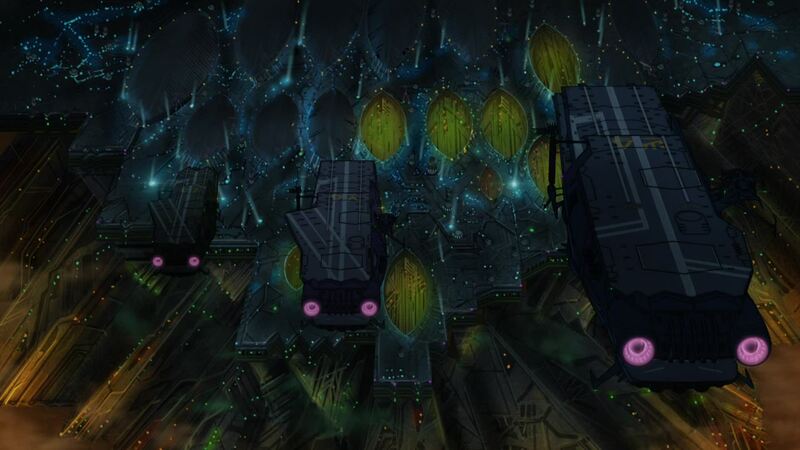 A message from Frakken is received aboard the Domelaze, saying “the sheep has entered the lost forest.” Haidern tells Domel he was right after all. Domel gives the order to commence the operation. [LC]: This was another sequence that appeared incomplete in the episode preview, featuring a plain star field in the background. Click here for a side-by-side comparison. 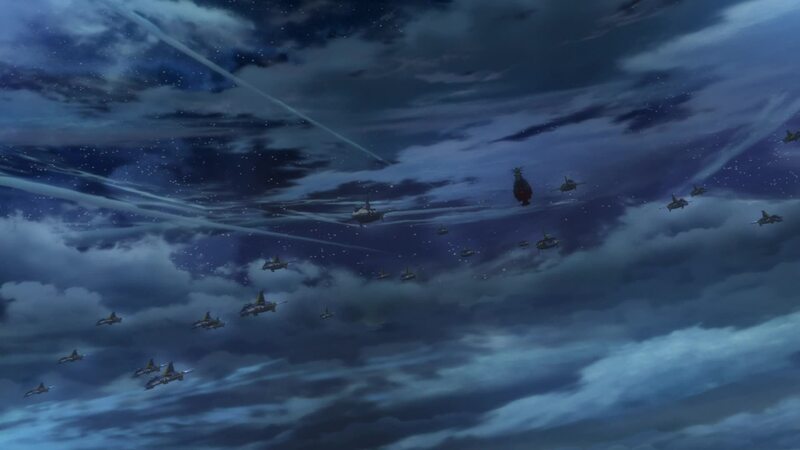 This scene of Balgray deploying and Ghetto’s squadron launching is based on the start of the original Episode 22, the battle episode itself. In this new narrative it was preempted. Immediately, Balgray accelerates toward its pre-planned attack position, leaving the rest of the fleet behind. Captain Moldo Vokk gives the order for Fighter Group 1 to prepare for launch. Ghetto addresses the captain, saying he will count on him for the rest. Captain Vokk salutes Ghetto and wishes him good luck. 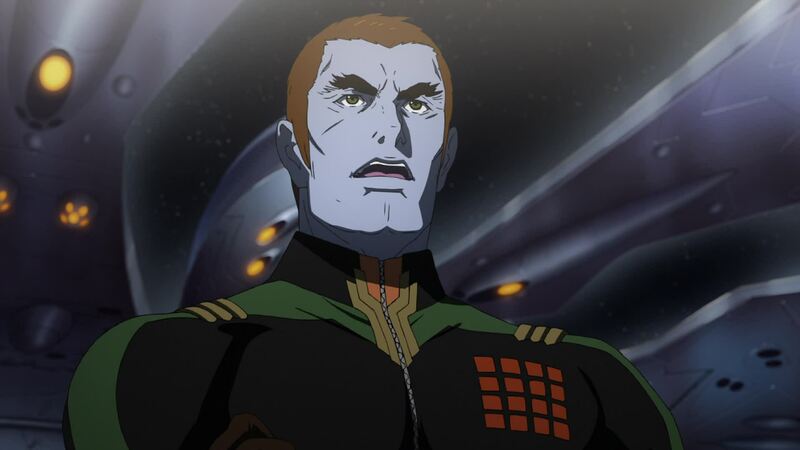 [LC]: The captain of Balgray is colonel Moldo Vokk. 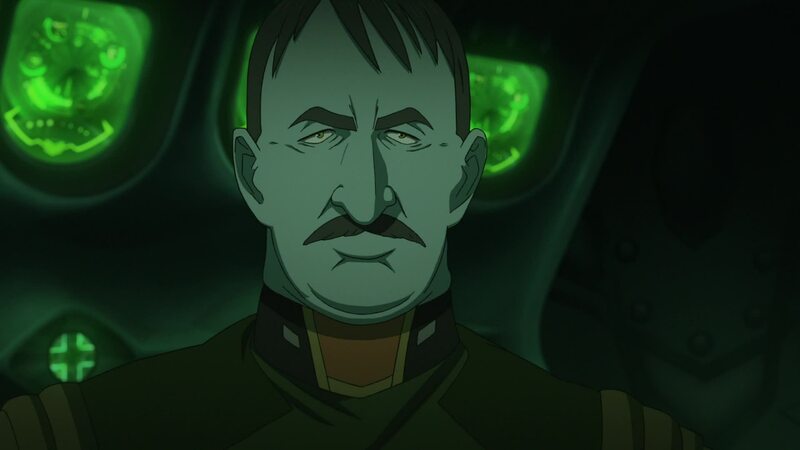 I know he isn’t a 100% likeness, either physically or in his personality, but I can’t help but think of Hitler when I look at him. Ghetto leaves the bridge and heads to the bustling flight deck. One by one, the squadrons of Debbake-class fighters are launched. Ghetto boards his custom Debbake and signals the deck crew. 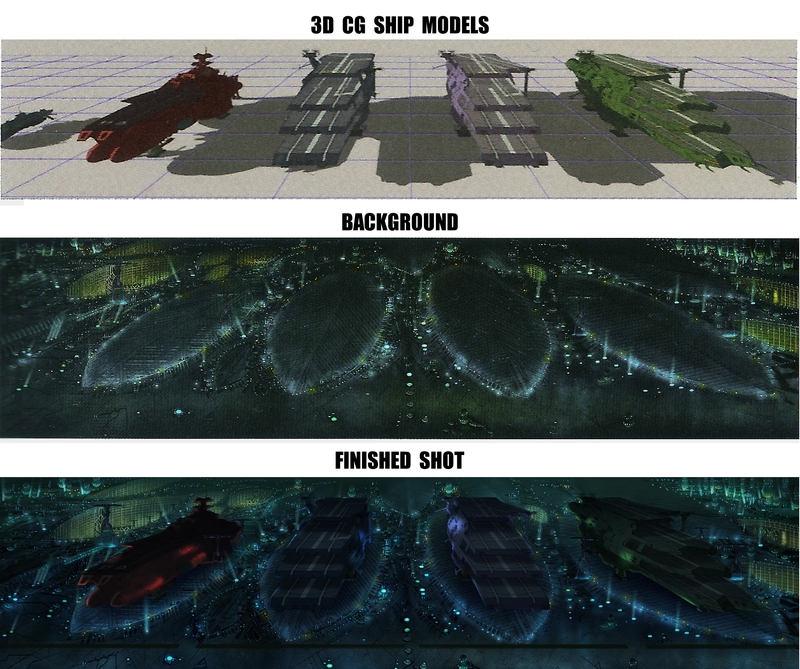 [LC]: Despite the amazing detail that 2199’s 3D CG models have, they are a bit plain in some respects. Because of that, these close-up shots in the hangars and runways of Balgray required the “detail-up” technique to give them more depth – another great work by Mr. Nishii. Similar scenes in the other carriers underwent similar treatment. Click the image above left for a sample. The Garmillan writing next to the cockpit reads “Lyle Ghetto.” That’s as close to an official spelling as we’ll get. His fighter is raised to the top deck and given the all clear. Seconds later, Ghetto speeds forward, taking the lead of the First Attack Force. 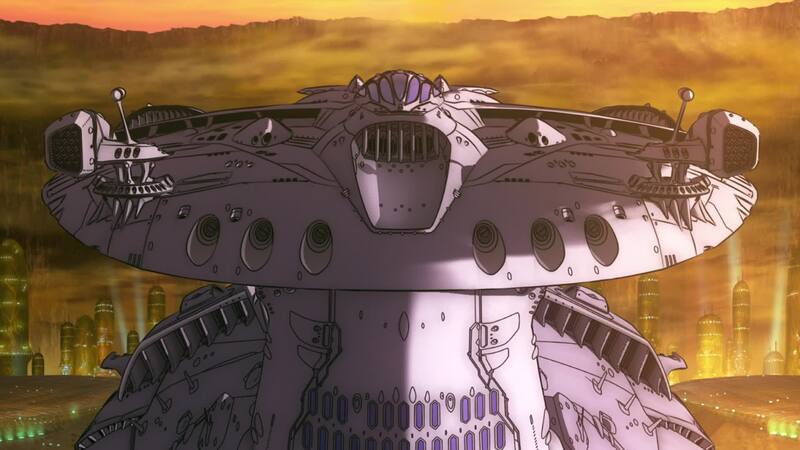 [LC]: This scene of Ghetto’s Debbake rising up to the top deck was designed by Yutaka Izubuchi to look exactly like the one in the Macross opening title. Mr. Habara didn’t want to do it that way, but Izubuchi insisted. The setup to the elevator scene has an error in it, which ironically makes more sense than if it had been done “correctly.” We see a shot of a Debbake, already set in its catapult and with the blast shield raised behind it. If you look carefully, you’ll notice the elevator is located behind that, meaning the blast shield is positioned too far ahead. In the 3D models of the Guipellons, as well as the rest of the sequence, the starting point of the catapult and the blast shield are located further back, behind the elevator. But if you think about it… is that the best setup? The one we see here seems more logical, as you can launch a fighter from the catapult while another is being raised to follow suit. With the elevator intersecting the catapult, you raise the fighter, back it up to the start position for launch, and cannot use the elevator again until that has occurred. Meanwhile, Yamato continues to push forward, battling the stormy skies. 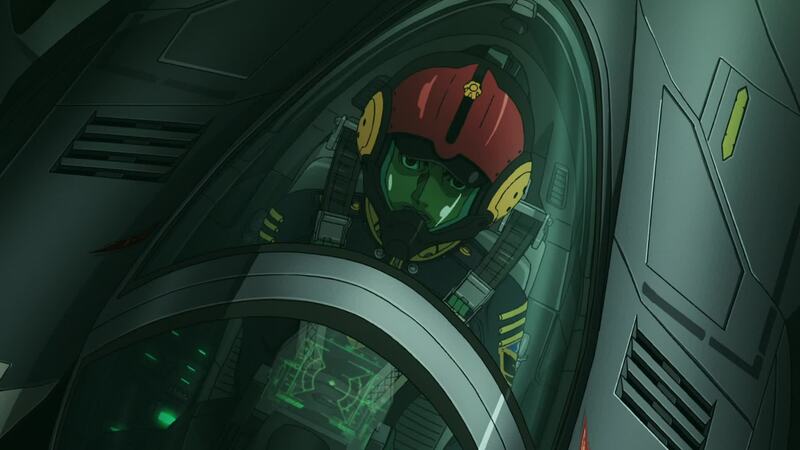 Yamamoto sits silently in the cockpit of Alpha 2. 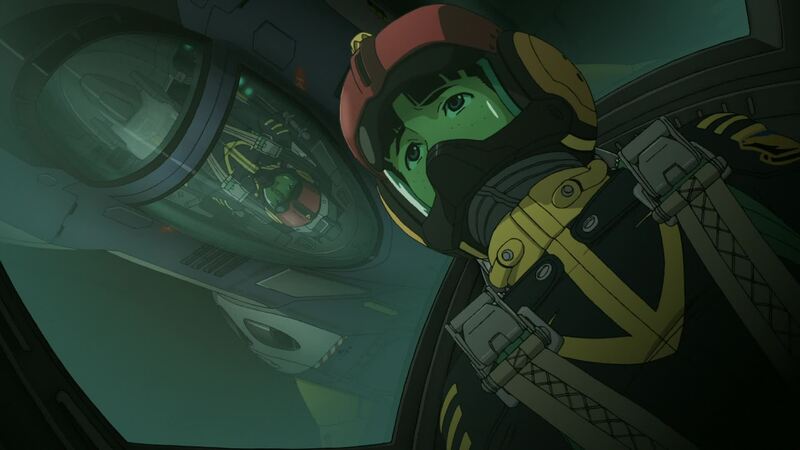 In the main hangar, rookie pilot Kobashi wonders if the enemy will attack in such rough seas, especially now that Shino isn’t with them. Daikuhara tells him not to be scared, much to the rookie’s chagrin. He says he’s not scared and Daikuhara tells him not to worry. If anything happens, he’ll work hard enough to make up for Shino’s absence. 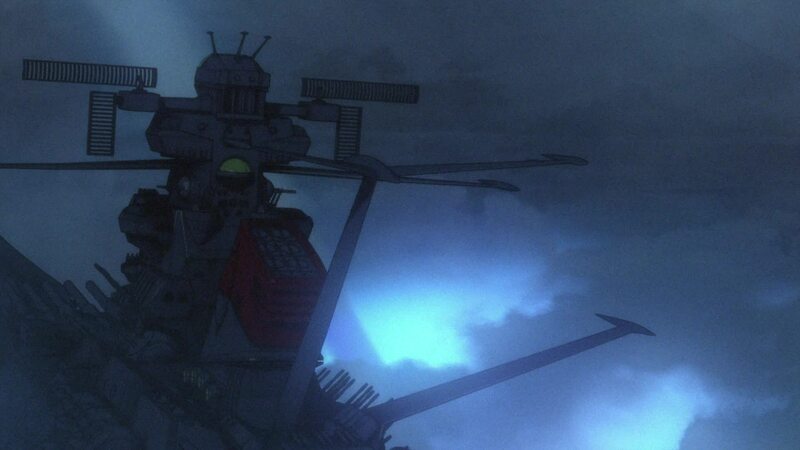 [LC]: Yamato’s movement through this shot is meant to mimic a shot in Yamato III’s opening title. 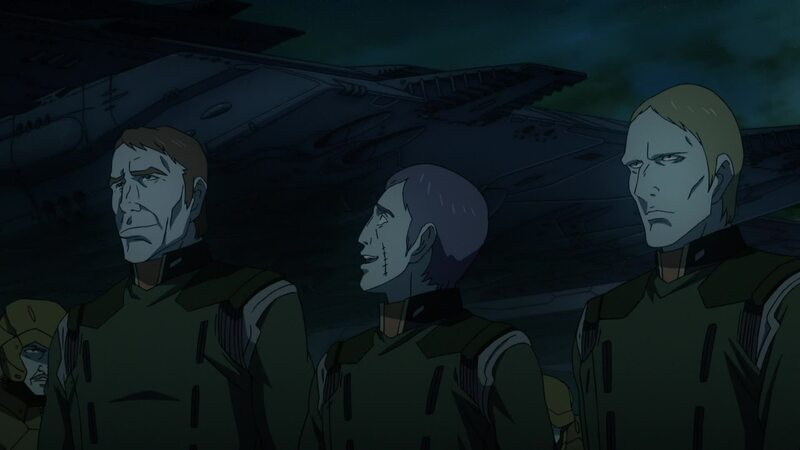 Though they’ve appeared before, this is the first time these three pilots are named in dialogue. They’re (Sho) Sawamura, (Takuya) Kobashi and (Takeshi) Daikuhara. Sawamura has gotten the most exposure and he has an important role ahead of him. Sawamura jokingly says he’ll hold him to that. Kato brings the banter to an end, stating that if the enemy attacks under those conditions, they’re the only ones who can protect the ship. Sawamura says they’re leaving Yamamoto behind, with Kato stating that she’s their ace in the hole. [DG]: With this statement they’re confirming that Kodai is remaining on the bridge and not leading the fighters in this battle like he did in the original. In the brig, the rocking caused by the storm is rattling Ito’s nerves. He goes on a tirade about not trusting aliens or they will all die. 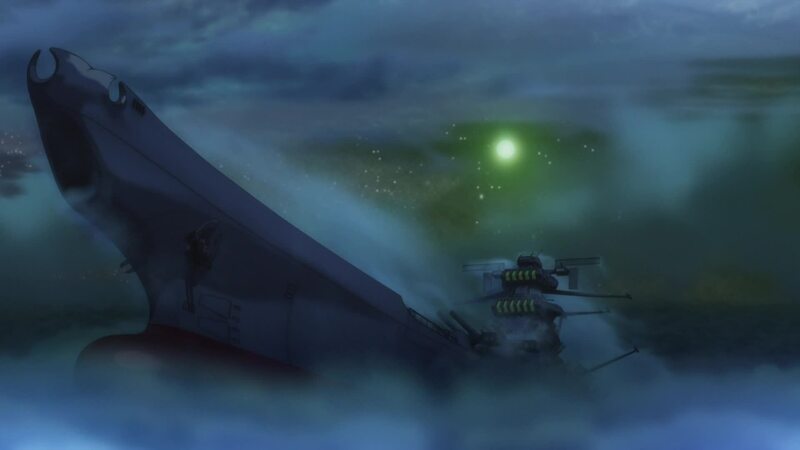 Eventually, Yamato leaves the storm, entering a calmer area under three different colored stars. Ota announces they’ve broken through the turbulence area. Shima says the seas are calmer out here. [LC]: Ito, locked up in the brig, continues to be a douche. A scared-out-of-his-mind douche… but a douche just the same. This pan shows three different stars as Yamato travels right to left. In that order we see a green, purple and blue star. This last one must be the closest, since most of the surrounding gas clouds reflect that color. Yuri(sh)a is in the port observation deck, looking at the nebula as if sensing something. On the bridge, the radar screen comes to life. Saijo reports the approach of a fighter formation, approximately 27 light-seconds away. 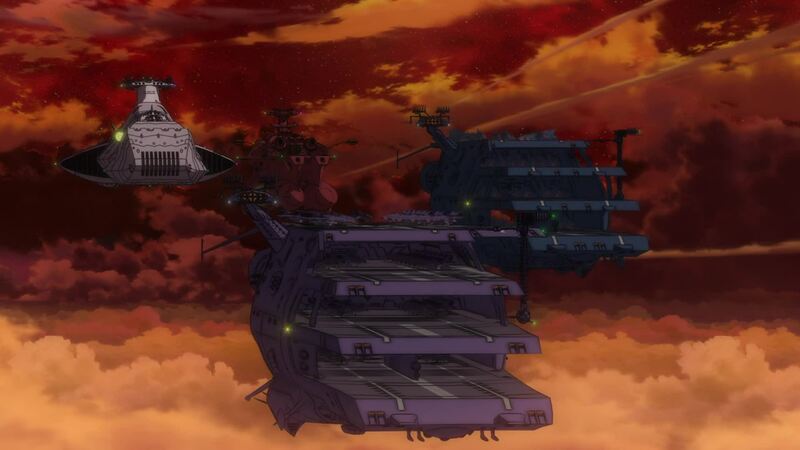 Okita orders the crew to battle stations and Kodai gives the order for the fighter group to launch. 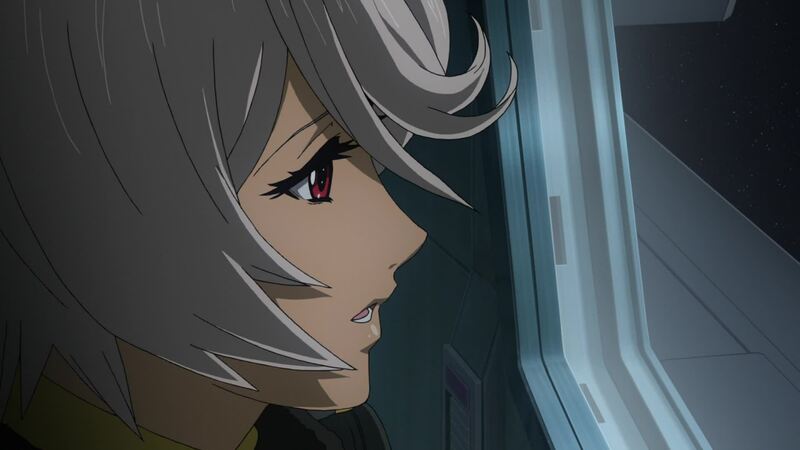 With the alarms blaring, Yuri(sh)a continues to look out the windows of the observation deck, her eyes fixed on a far-off point in space. She calmly states the enemy have arrived and brought war with them. 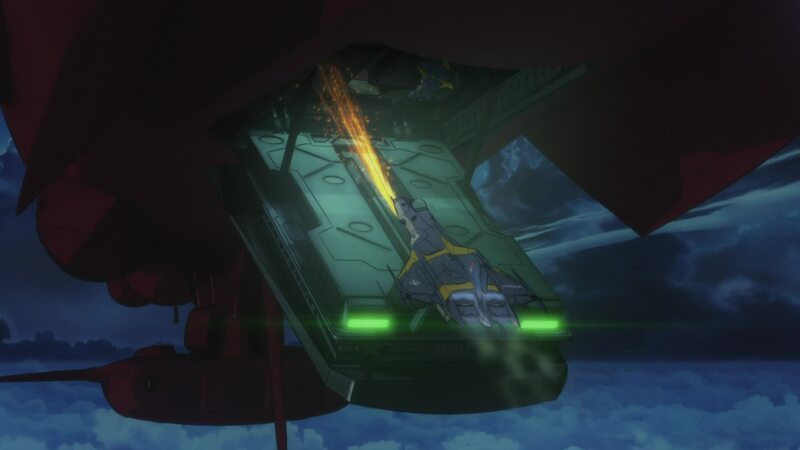 Once again, the precise machinery of Yamato’s main hangar comes to life, releasing the Falcons one by one. All joking aside, Yuri(sh)a displays some serious mind powers, whatever they might be. Not only is she capable of possessing a human body while in a comatose state, she displays tremendous awareness of her immediate surroundings to a wide extent. You almost feel as if she can actually see the approaching Garmillas ships. 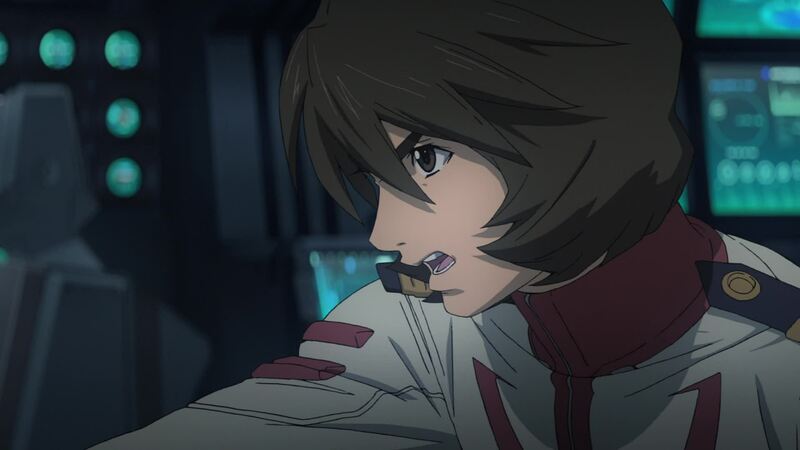 Kato is the last to launch, quickly reaching his comrades and taking the lead of Yamato’s combat group. Saijo reports all fighters have been launched. [DG]: 22 Hayabusas appear to have deployed (click on the above right image to see an enlargement). This is also reflected in the reverse shot as they fly away from the camera. 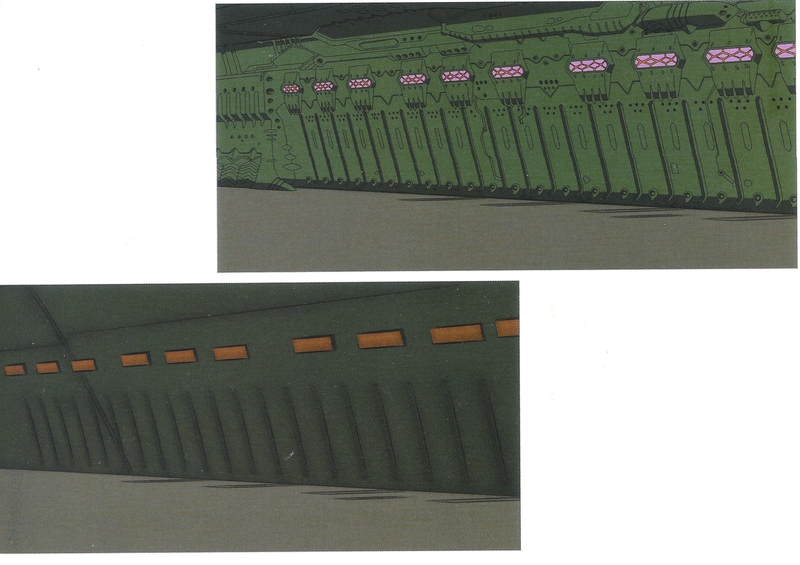 However, in Volume 2 of Complete Works, an image of fighter formation specific to Episodes 19 and 20 on page 342 (second row, rightmost) says 24 planes are in formation. We’ll have to see if in Episode 20 we get another opportunity to count the entire group. 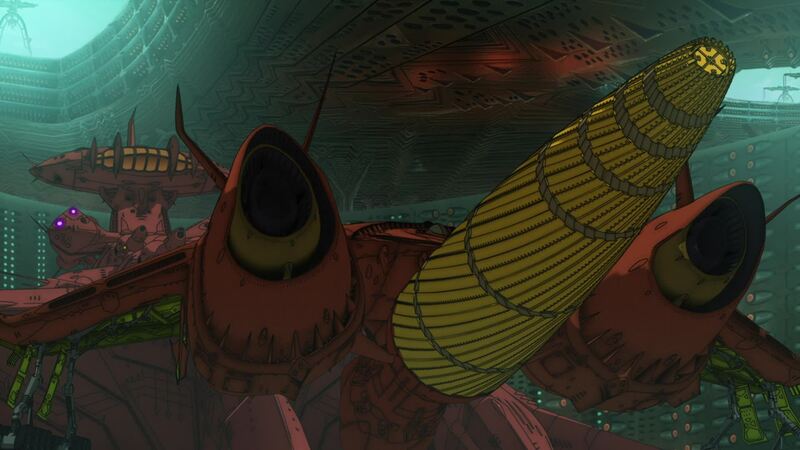 According to the Yamato 2199 Earth book, Yamato carries 32 Hayabusas and 4 spares. They’ve deployed 22 planes, and left Shinohara on board. The ship’s pilot briefing room seats 24. 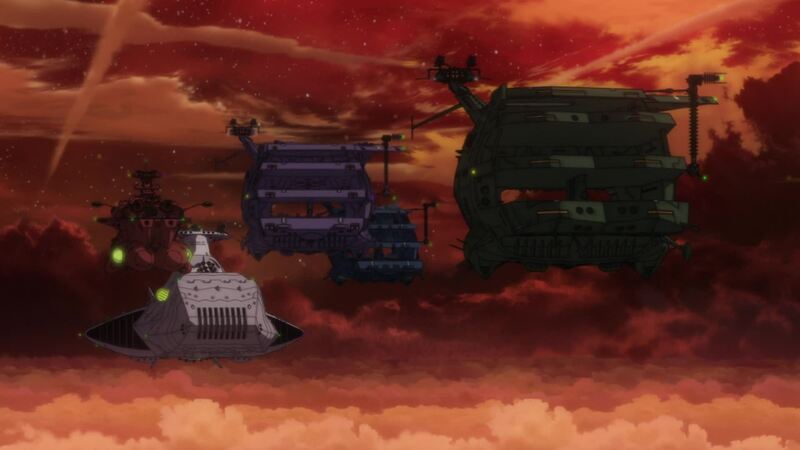 Looking at the various sources, including the Earth book and the 1/500 Yamato Expansion Kit, the number of 32 appears to come from two rows on the carousel, with the front one having eight pallets with two planes each. However, the rear carousel can’t have that many because there has to be room for the bay door/catapult. In any case, it makes you wonder if there were 32 planes available (and 32 pilots), why they didn’t launch all of them in this situation? An obvious explanation is that they have a reserve shift, since pilots can’t be alert 24/7 – and the other pilots are off duty somewhere on ship (doubt they’d be able to sleep throught this, though). Something else to discuss later. Interesting that Kato refers to his plane number here, rather than any callsign. As a note, “100” is commonly used as the numeric identifier for the Air Wing Commander’s aircraft in US Naval air wings (200 is sometimes used as well). [LC]: Whenever I see the Falcons’ flyby into the distance, I can’t help but recall similar sequences in 80’s sci-fi shows like Buck Rogers or the original Battlestar Galactica. The combat group speeds away from Yamato and toward their quarry who, commanded by fearless Ghetto, proceeds to the combat zone. [LC]: Again Mr. Habara uses the back and forth between Yamato and Garmillas to show the similarities between both sides. To this day, this final sequence is still my favorite in the entire series. Ghetto seems to have learned to follow combat pilot protocol. In the original he didn’t wear his mask or his visor. Okita looks ahead, thinking of the battle that is about to begin and of the fierce enemy commander who almost destroyed them – surely the same one waiting for them now. 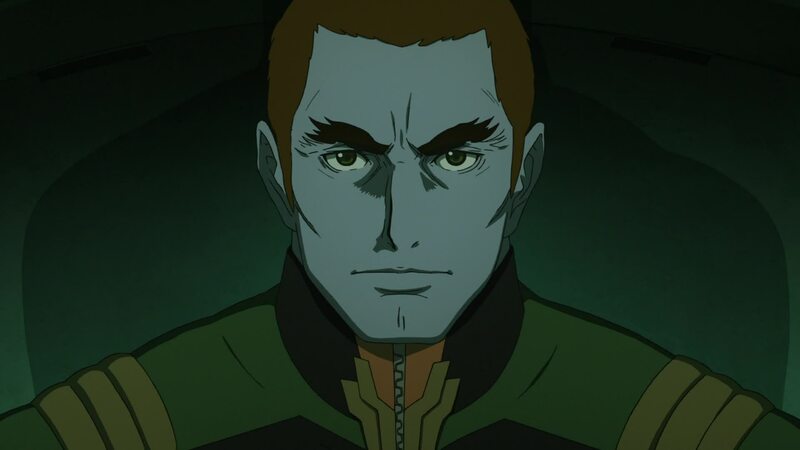 We see the eyes of a determined man who knows this is a battle he cannot lose if Earth is to be saved. The Domel task force advances. Domel looks ahead, thinking of the battle that is about to begin and of the captain who has led the Terrons so close to his home. We see a determined man who knows this is a battle he cannot lose, even at the cost of his own life. His honor and the safety and pride of his home world demand it. The fierce battle of the Rainbow Star Cluster is about to begin. Survival versus honor… which will prevail? [LC]: When Mr. Habara drew the storyboard for this scene, he referred back to the original Rainbow Star Cluster episode. The camera was right up to Domel’s face in a tight close-up. 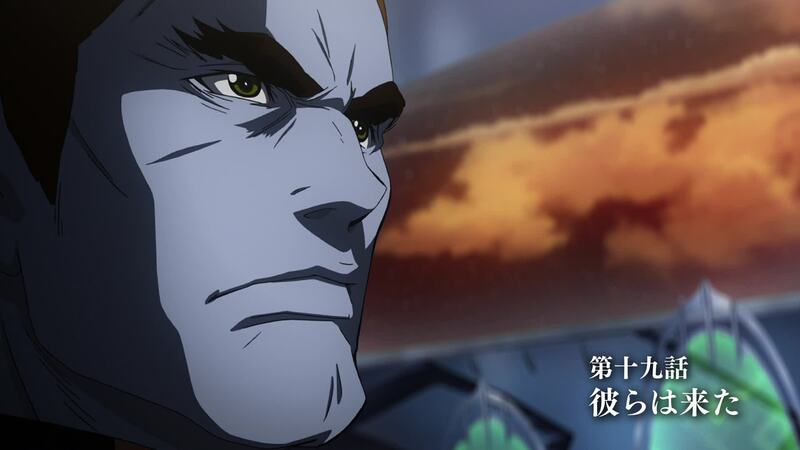 The scene made it into the episode preview, but general director Yutaka Izubushi saw it there and decided it was too much. This slightly toned-down but still manly-as-hell close-up replaced it. Click Domel’s face to see a side-by-side comparison. [DG]: Overall, this episode is very well-balanced, swapping between each side’s leaders with their key issues, showing both men to be of great wisdom and intellect – building the next episode up with not a second of air time wasted, each scene playing its part. It turned what was largely a filler episode in the original into a magnificent buildup to the iconic battle we see in the next. I’d go as far as to say this was 2199‘s best episode, in terms of pacing, production values, and expanding the plot of the original version to the point where everything fits together almost perfectly. 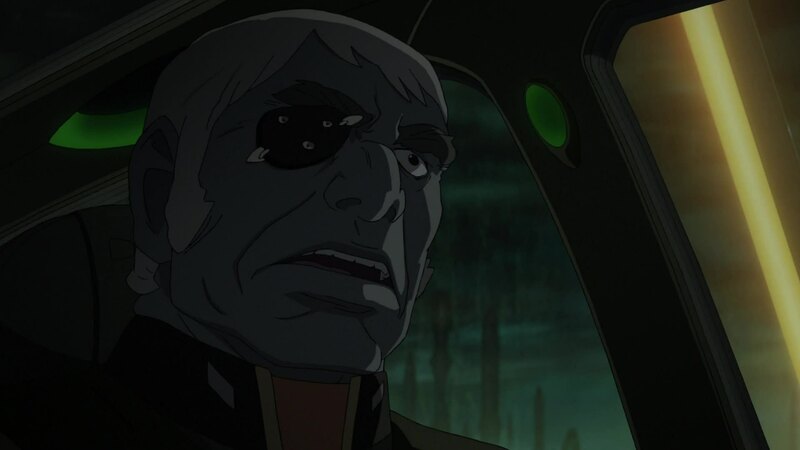 It was this episode that confirmed who I would want to direct a remake of Yamato 2 were Yutaka Izubuchi to decline the job. A pack of wolves descends. An invisible hunting dog lurks in the shadows, ready to strike. The battle begins in a rainbow sky. The time has come to decide the final victor. This battle is a test that must be passed. Next time: Under the Rainbow Sun. There are 245 days left before humanity becomes extinct. Tohoku Shinsha Film Corporation, Shochiku Co. Ltd., OLM, Lantis Co. Ltd. 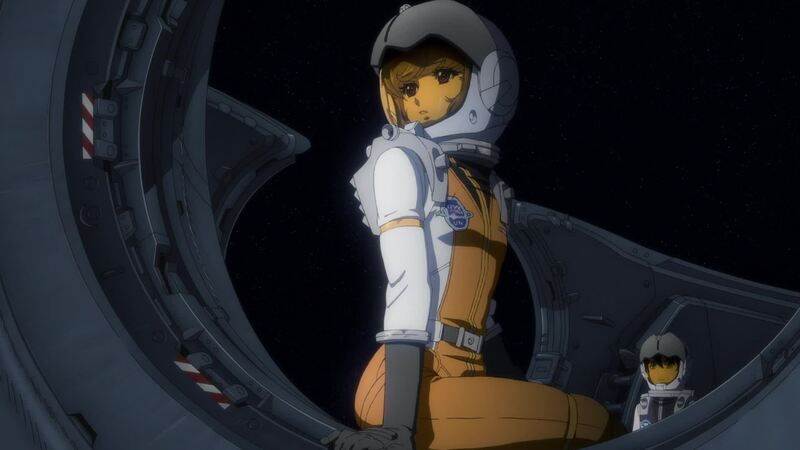 This entry was posted in Yamato 2199 Commentary by Luis Cotovio. Bookmark the permalink. Uh oh. Four carriers manned mostly by old guys and inexperienced rookies plus one battleship set up against one lone battleship. Add UX-01 and the commando team and we have a nightmare situation. 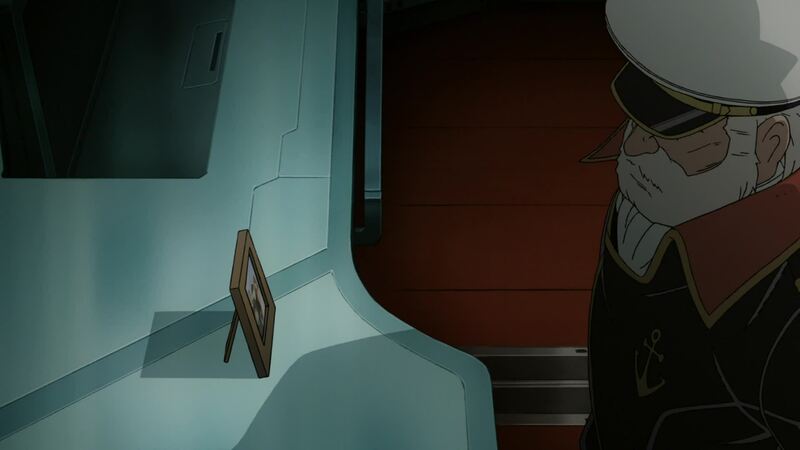 Yes, we know Domel’s special delivery to Dessler is supposed to be Yurisha, but nobody outside Yamato’s crew knows that her real body is currently comatose! For all I care, Yuki’s going to get kidnapped instead. As for aircraft, the Debbake seems to resemble the Lippisch department projects at Messerschmitt AG, so the official designation DWG.109 makes only cosmetic reference to the Bf-109 (unless you count the cramped cockpit)… Or did I mess up? Well, I won’t spoil things for you, but let’s just think about it. 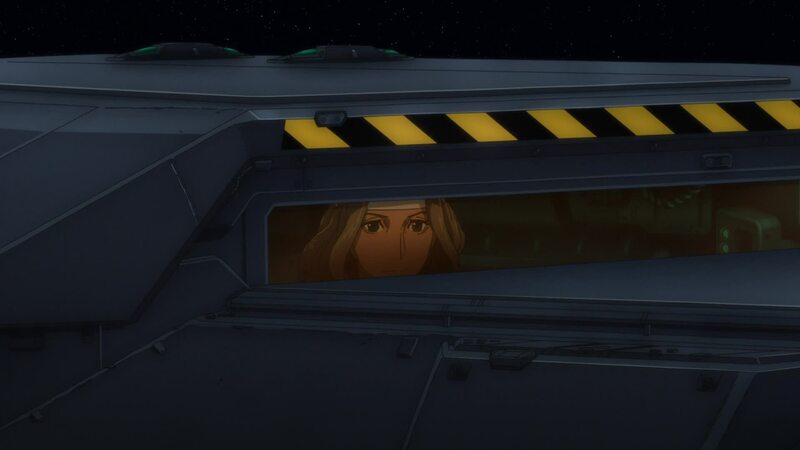 Dessler knows Yurisha is aboard Yamato thanks to Celestella. 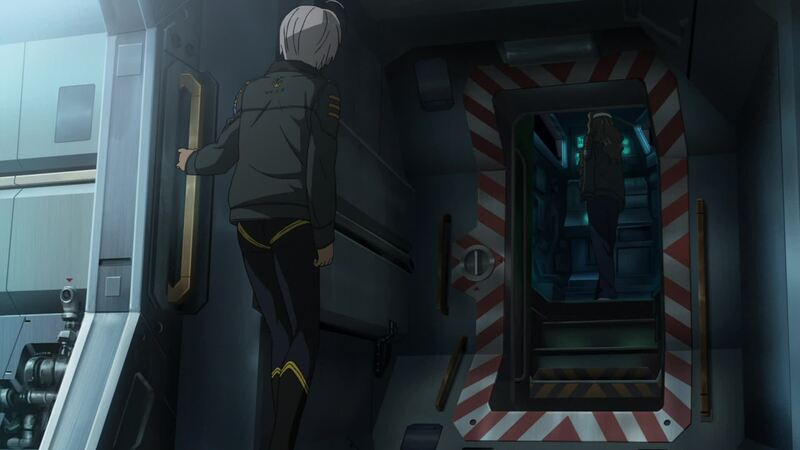 He would not know whether or not Yurisha was in good condition to exit Yamato. Based on appearances alone, Yuki gets mistaken for Yurisha (oh fiddlesticks!) and this view is likely reinforced by a late somebody’s really unwelcome memory scan. 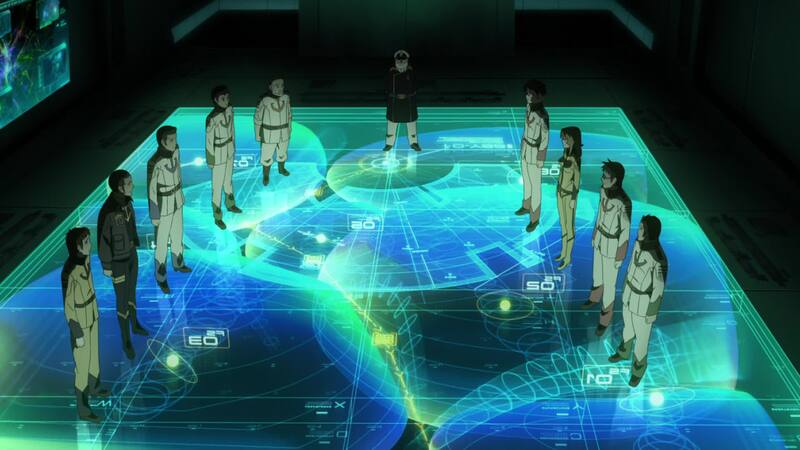 So when the Zaltzi commandoes are briefed on their mission, they are probably going to be told to look for Yuki. Why isn’t Yuki at her post? 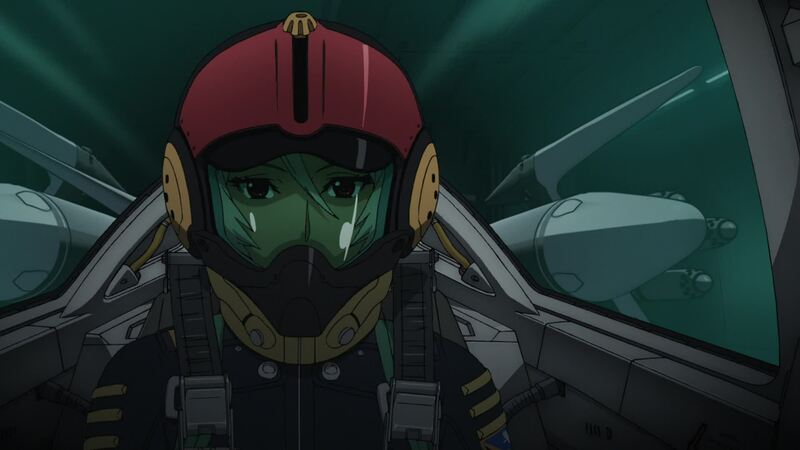 Perhaps it isn’t her shift yet due to crew rotation (crew fatigue would be quite nasty on this potentially one-way trip, and I pity Shima for not having a back up pilot in case he gets knocked silly), which makes things all the more convenient for the kidnappers now that they won’t need to kill everyone between the infiltration point and the bridge! I could be mistaken, though. Regarding the problem of not having a defined number for the length of the Gamilon/Garmillan year: as a matter of fact there is a way to find out the length of their year. In the original episode 23, Shima notes that the average distance from the Gamilon/Iscandar system to their star is 300 million km, or about 2.005 AU. (An AU is defined as Earth’s average distance from our Sun, so Gamilon/Iscandar are approx twice the distance from their star as we are from ours.) Kepler’s third law states that the orbital period (year length) squared is exactly proportional to the cube of the semimajor axis of the orbit (the average distance a planet is from its star). Since we know the latter, we can calculate the former. Thus, the length of Gamilon’s year is 2.839 Earth years, or 1036.8 Earth days. A more accurate calculation can be derived using Newton’s formulation of Kepler’s third law, which takes the masses of both the planet and its star into account. I’ve personally calculated the combined mass of the Gamilon/Iscandar binary system at 4.88 Earth masses, which one can do since the mass of a terrestrial planet is directly proportional to its radius. The diameter of Gamilon is provided on the original episode 23 (16000 km, with a radius therefore of 8000 km) and Iscandar is stated on the original episode 25 to be 1.3 times the size of Earth (giving a radius of 8282.3 km). Given the fact that the habitable zone of their star must include 2.005 AU, the mass of the Star may be roughly estimated at 1.2 solar masses (the mass of a star is directly proportional to its,luminosity). If one takes both these mass values into account, then the length of the year falls slightly to 2.591 Earth years, or 946.459 Earth days. Elizabeth, as someone who hasn’t seen the original series in a while, let me thank you for clarifying that. I’m just not sure whether the dimensions of the planet are the same in 2199 as they are in the original series. 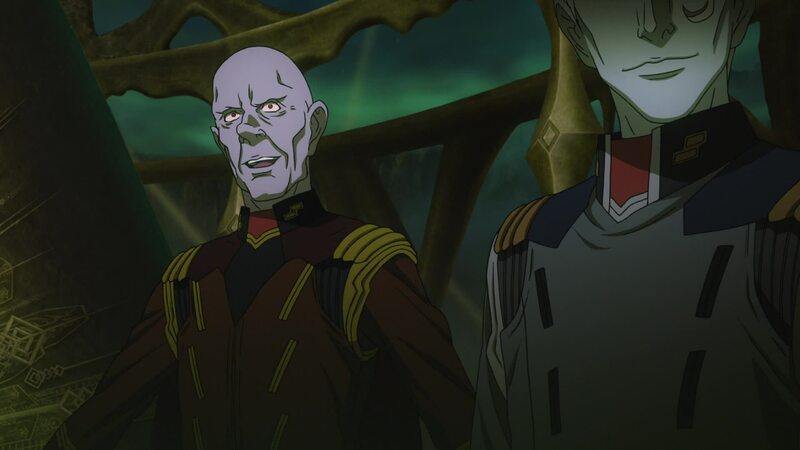 However, were we to assume that these distances are around the same in the 2199 universe, that makes Dessler’s reign alone 259 Earth years, and his age more than likely in excess of 300 Earth years. Depending on the genetic makeup of Garmillans and how much genetic engineering and medical advances have prolonged their lifespans, and the nature and effectiveness of these treatments, it makes the possibility of cerebral degradation a very real consideration. I’ll have to look up some more materials to see if the 2199 universe does mention this information. The game is set, the pieces are moving… And thus the most iconic battle of the classic series beings again! Man do I love the attention to detail of these Gamilias ships! Indeed, I think eventually I will have all of the 1/1000 scale models of these ships. I so enjoy the contest coming up in Ep20. The number picked for the 442nd is of course significant, being a reference to the 442nd Infantry Regiment of the United States, made up of Nisei volunteers whose family were being held in internment camps. Easy to see the parallels with the “second class citizen” volunteers here.